SNOW DAY! We are open. 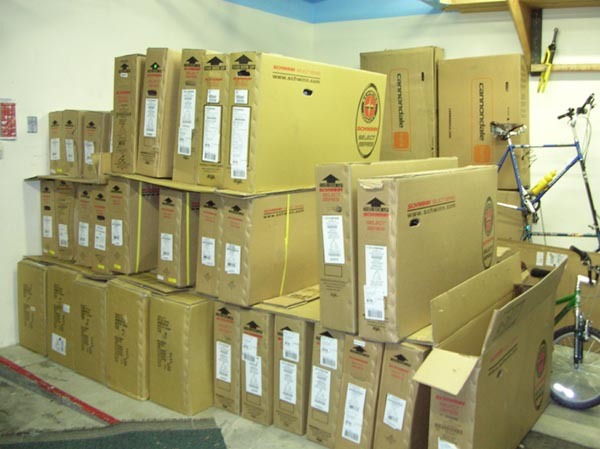 Part of our shipment of new Schwinn and Cannondale bikes. Our new awning finally arrived! We are busy assembling bicycles and putting the final touches on the new shop. There is still a ton to do, but less everyday. The cats are after us to install the cat door in the bathroom so they can use their litter box. 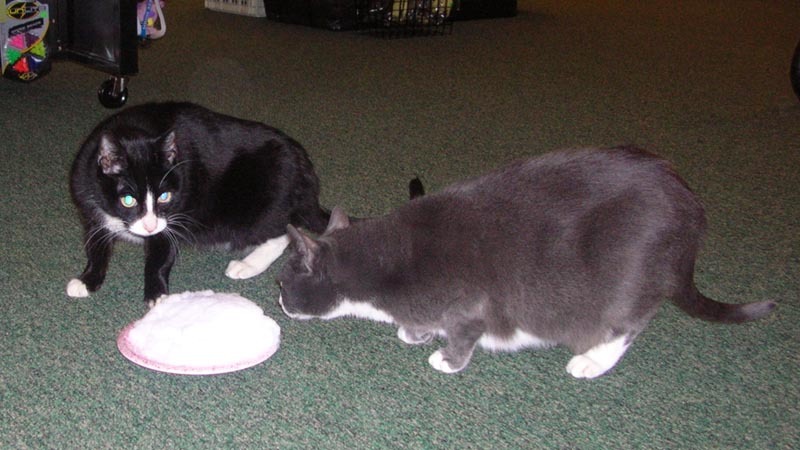 The cats now stay in the main shop at night so stop by and say hi after hours. Presta often sits in the north door way. Plus if someone ever breaks in, the will now get loved to death by Schrader! We hope the new awning stems the tide of people coming in saying, "Where's the liquor store?" We have taken to having a little fun with people, but it is nice to have a steady stream of folks coming in. We may start selling the airline size bottles. We figured that since we sell Schlumpf Drives, we should stock the parts for them. WE ARE MOVING......AGAIN! Thank you to the State of Washington Liquor Control Board for not renewing their lease at the Morgan Junction liquor store! Our landlord was more than happy to give us the lease. We will be doubling our space with 4 times more back storage! As of September 20th, 2008 you will have to get your booze in the Alaska Junction. Look for us to be fully moved in by December 1st. Our new address will be 6527 California Avenue SW. Everything else will be the same. 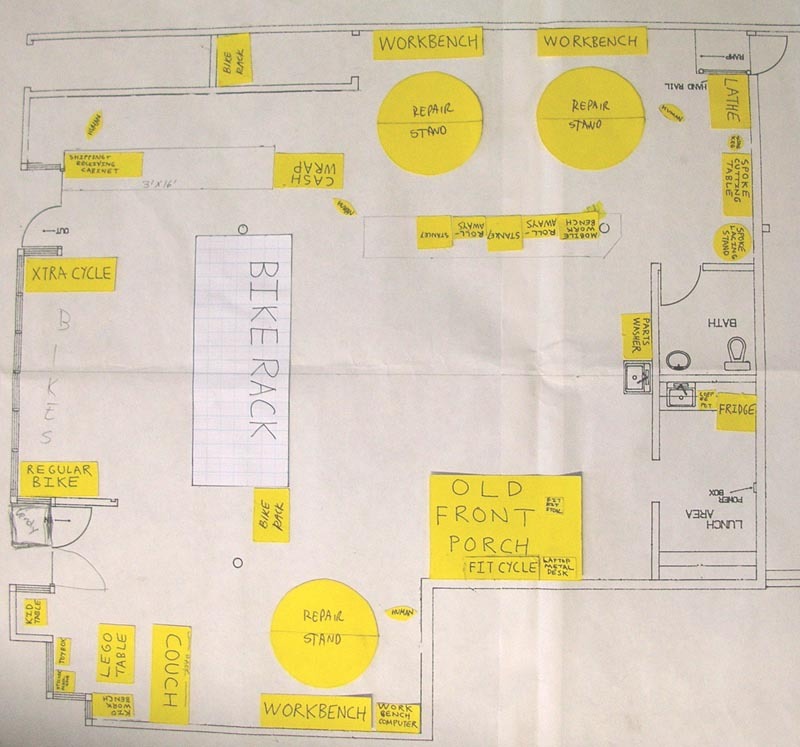 We will have the room to stock complete bikes, and other large bulky items like trailers, baskets, bags, trail-a-bikes, etc. WOW! This has been the busiest summer we can ever remember. We heard tales of 1972-74 (the Bike Boom) and we can imagine this as a similar time. Gas prices are high and everyone wants a bike. Well not everyone, the streets are still clogged with cars and the gas pumps have no lines.....yet. 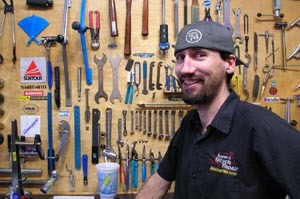 This summer has been somewhat mild and a little rain and falling gas prices (now under $4) have damped (or dampened) the demand for bikes and repair, but still business is good. That is why we have not blogged in over a month. Come see our empty shelves (just kidding, but it is a challenge to keep goods in stock) and busy mechanics. 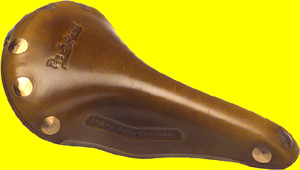 Big Dummies are back in stock as are Xtracycles (soon) and Brooks saddles. Hey, we even got a shipment of 27" tires and 700C tubes! 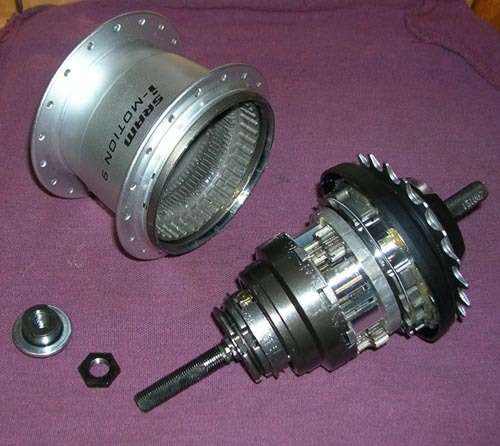 We have imported all the repair & common wear parts for the SRAM Spectro 7 speed hub. 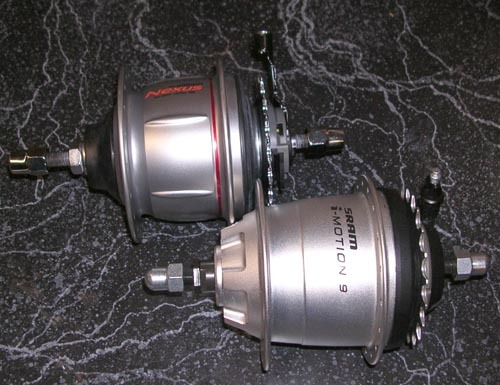 Shimano Alfine 8 Speed Hubs in stock! 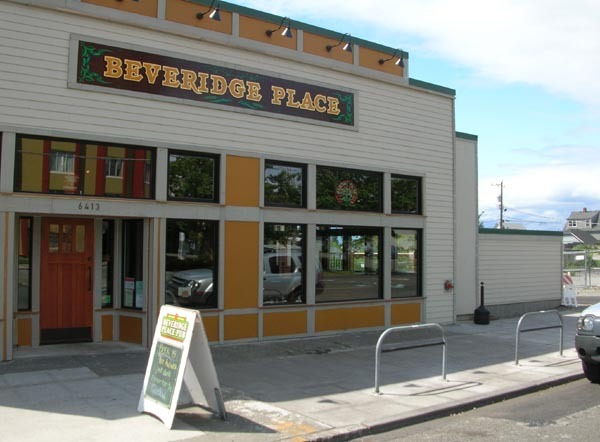 Beveridge Place now has two, yes 2, bike racks! RCW 46.61.790 Intoxicated bicyclists. 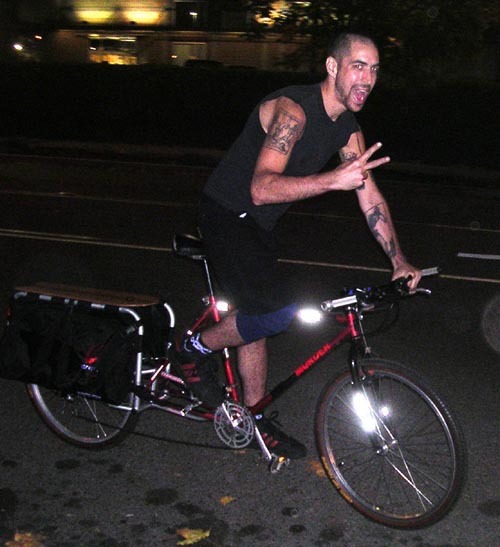 (1) A law enforcement officer may offer to transport a bicycle rider who appears to be under the influence of alcohol or any drug and who is walking or moving along or within the right-of-way of a public roadway, unless the bicycle rider is to be taken into protective custody under RCW 70.96A.120. The law enforcement officer offering to transport an intoxicated bicycle rider under this section shall: (a) Transport the intoxicated bicycle rider to a safe place; or (b) Release the intoxicated bicycle rider to a competent person. (2) The law enforcement officer shall not provide the assistance offered if the bicycle rider refuses to accept it. 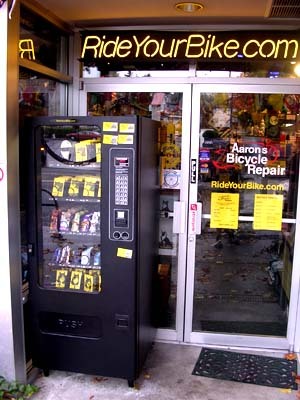 No suit or action may be commenced or prosecuted against the law enforcement officer, law enforcement agency, the state of Washington, or any political subdivision of the state for any act resulting from the refusal of the bicycle rider to accept this assistance. 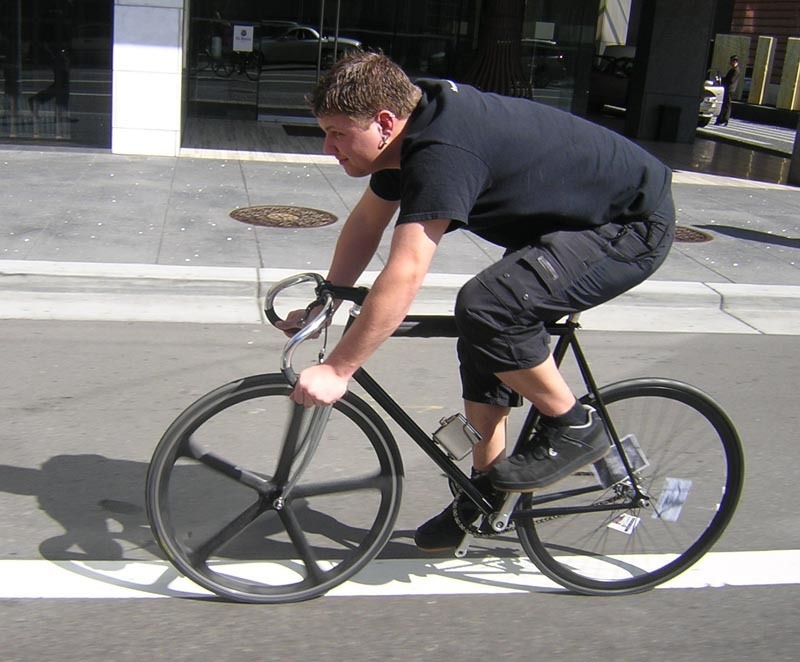 (3) The law enforcement officer may impound the bicycle operated by an intoxicated bicycle rider if the officer determines that impoundment is necessary to reduce a threat to public safety, and there are no reasonable alternatives to impoundment. The bicyclist will be given a written notice of when and where the impounded bicycle may be reclaimed. 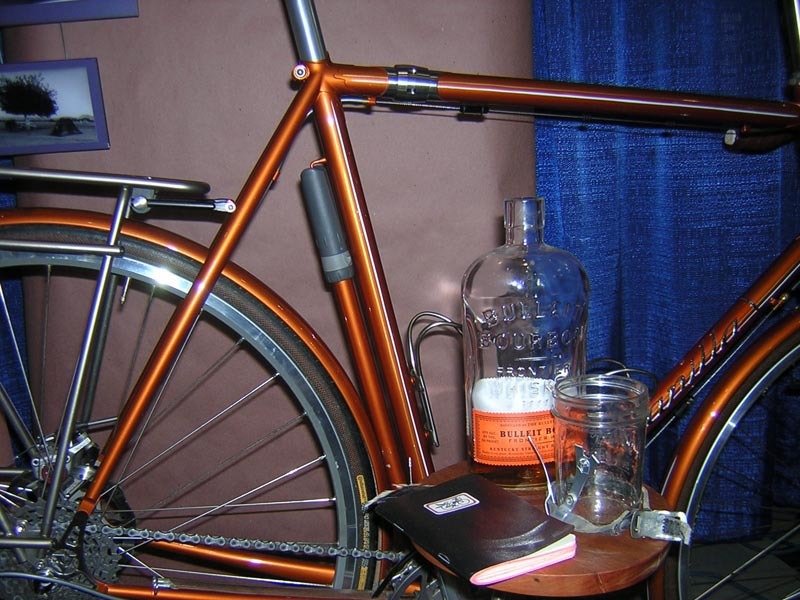 The bicycle may be reclaimed by the bicycle rider when the bicycle rider no longer appears to be intoxicated, or by an individual who can establish ownership of the bicycle. The bicycle must be returned without payment of a fee. 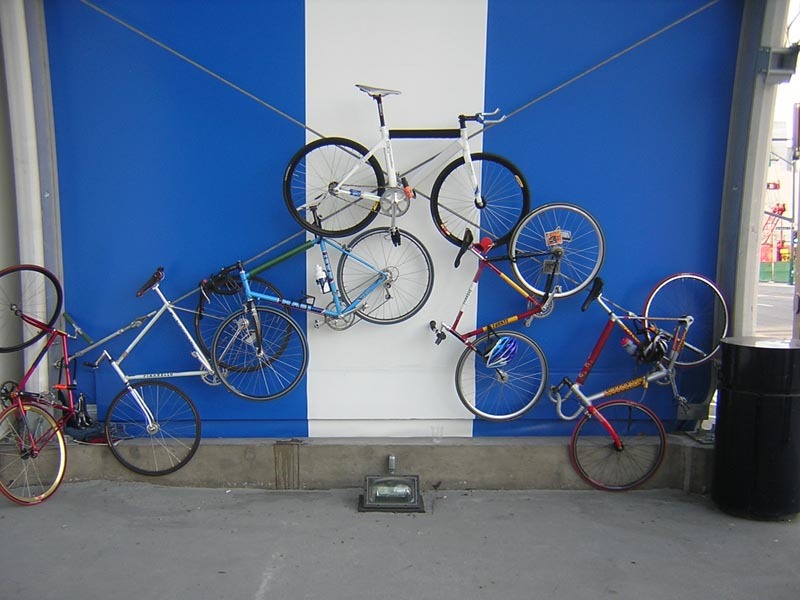 If the bicycle is not reclaimed within thirty days, it will be subject to sale or disposal consistent with agency procedures. 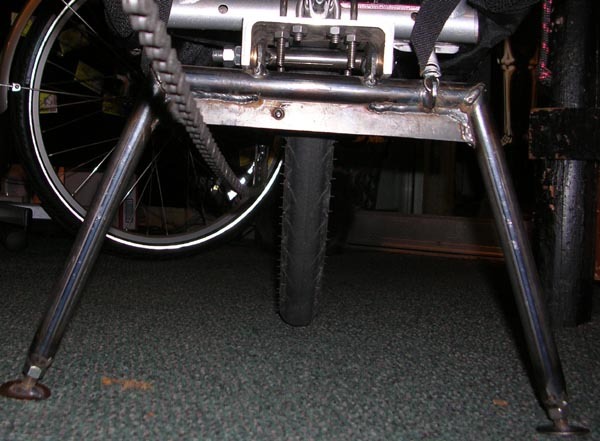 Spy photos of the Rolling Jackass Xtracycle/Big Dummy specific Centerstand by Val Kleitz. We are taking orders/deposits now! 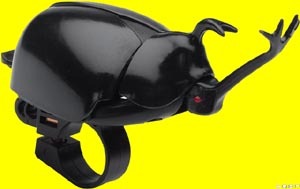 Second generation prototype, Hardware is the same as the final version. 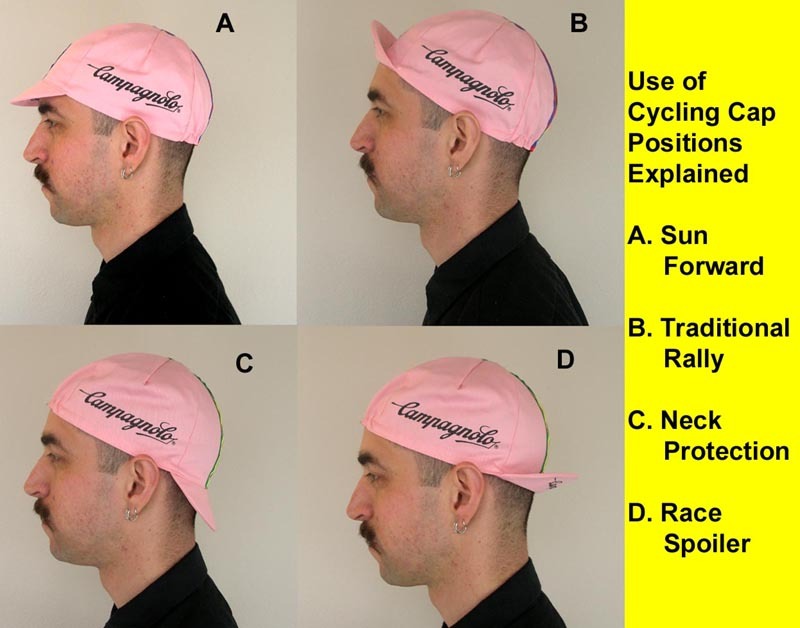 Our manager, Gregg, shows you how to properly wear your cycling cap for various riding conditions. Our build of the Big Dummy is complete! Test rides available. 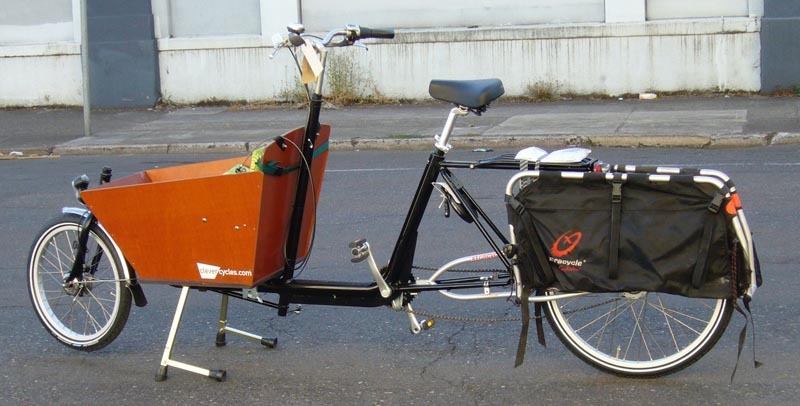 Check out how Val transported 2 bikes for the Momentum Magazine reporters Mia and Tanya! They checked out Seattle via bike, of course. Thanks to Seattle Bike Supply for loaning them and Val for hauling them. Who needs a roof rack? 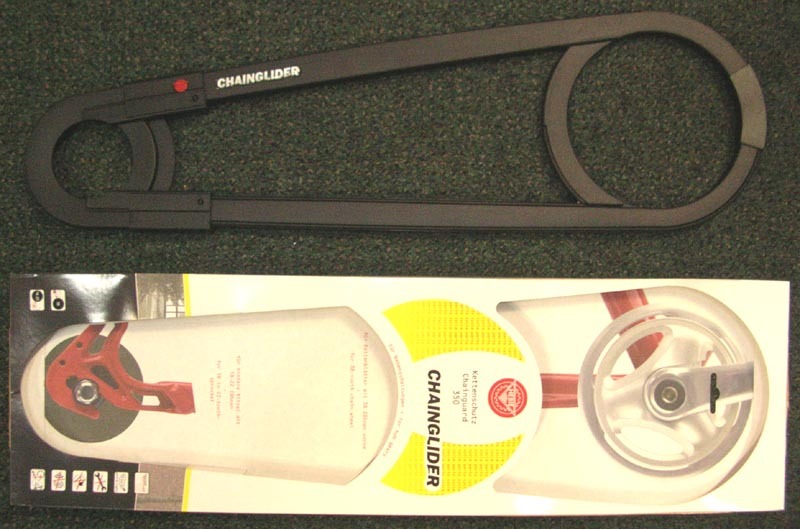 Hebie Chainglider chaincases in stock. Look what the Brown Santa brought us today! February is a crazy bike month! So many events. 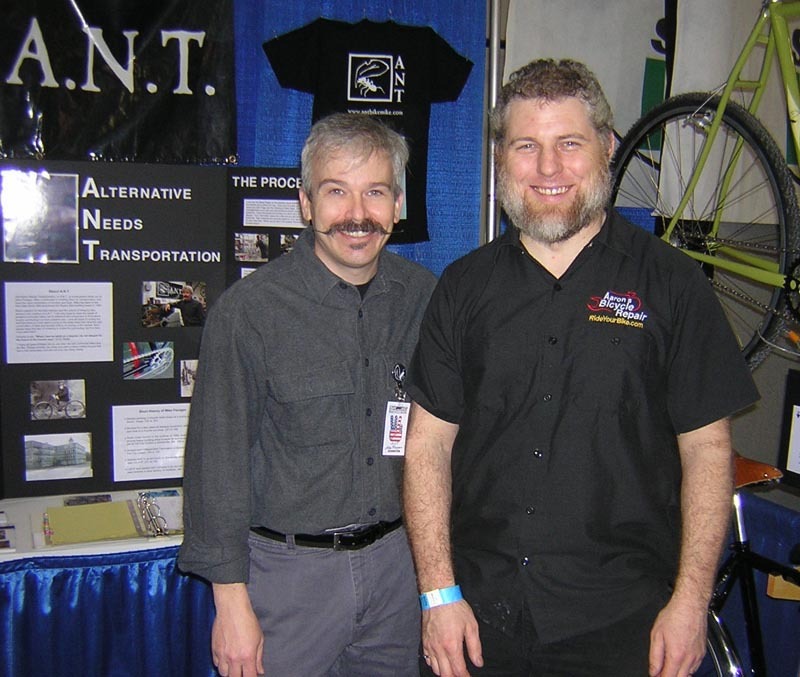 We have attended the NAHBS & Frostbike and will attend the Seattle Bike Swap, the Bike Expo and Chilly Hilly/FHR. So much fun, so many cool bikes! 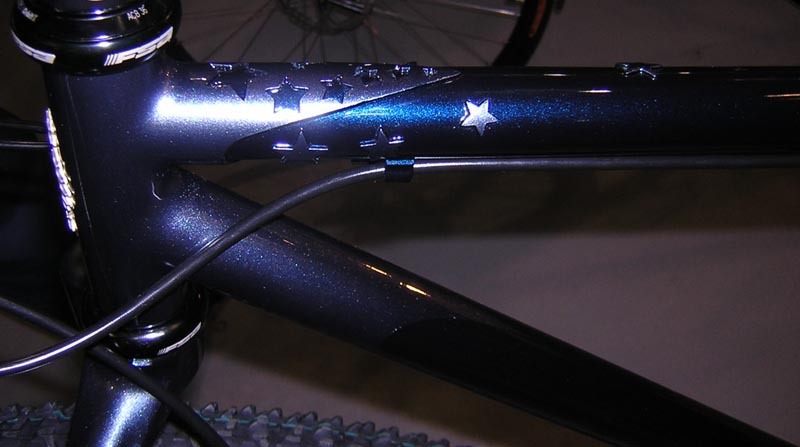 2008 is shaping up to be the year of the bike. We just hope 2009 is even crazier! Big Dummy due Tuesday!!!!!!!! We have 3 coming and more on the way. For now the only size we have is 18". Here is how we are going to build the floor model. 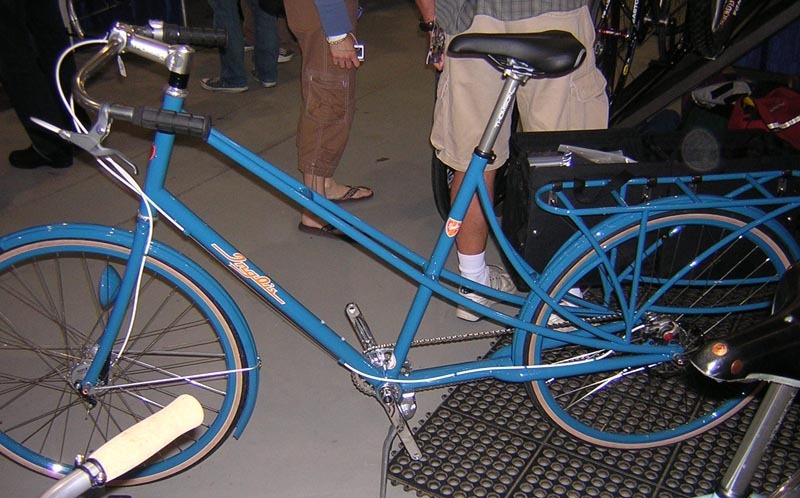 It should be possible to use the Shimano FFS freewheel to build a replica of this bike. 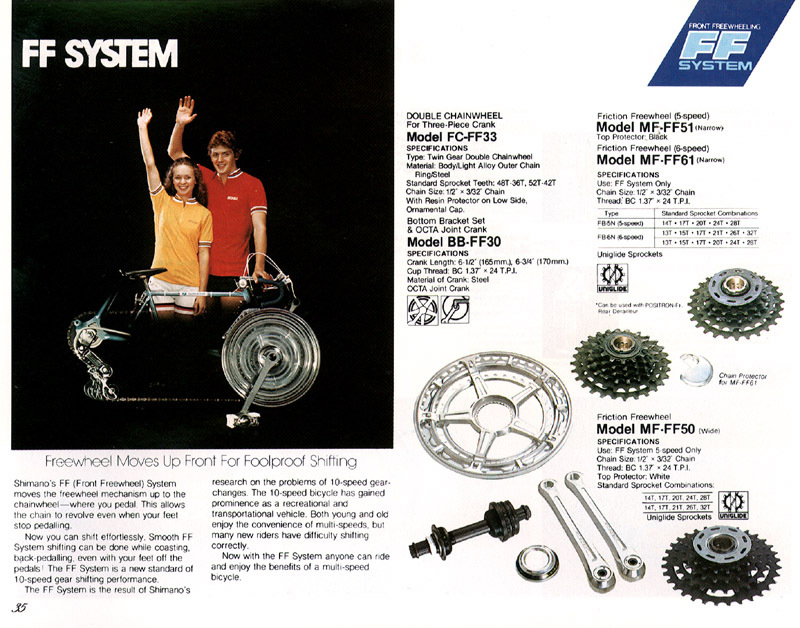 Shimano FFS freewheels had independently freewheeling cogs. 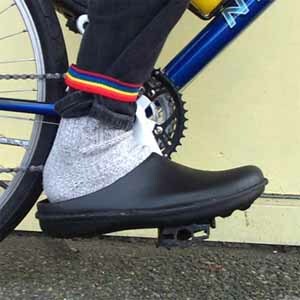 They were sort of a fail safe device in case the front freewheel locked up, the bike would not turn into a fixed gear. 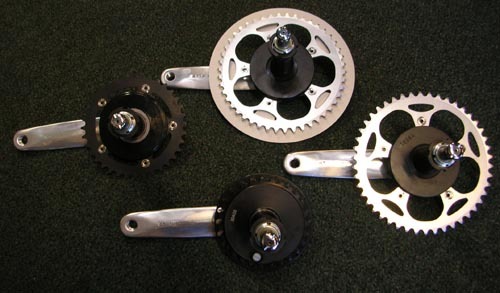 TerraCycle in Portland, Oregon makes excellent idler pulleys. 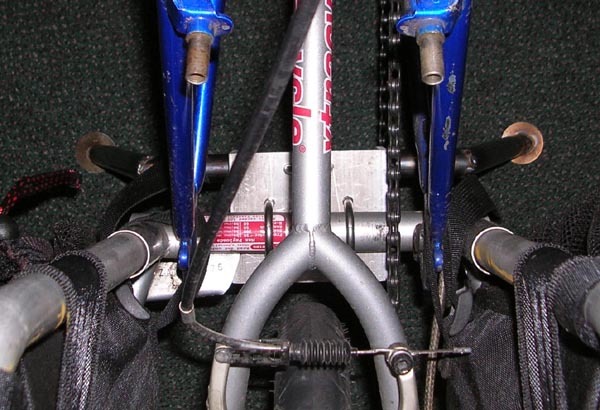 The clamp will need to be specific to the bike as chainstays vary in diameter. Update: We found someone that has done it! 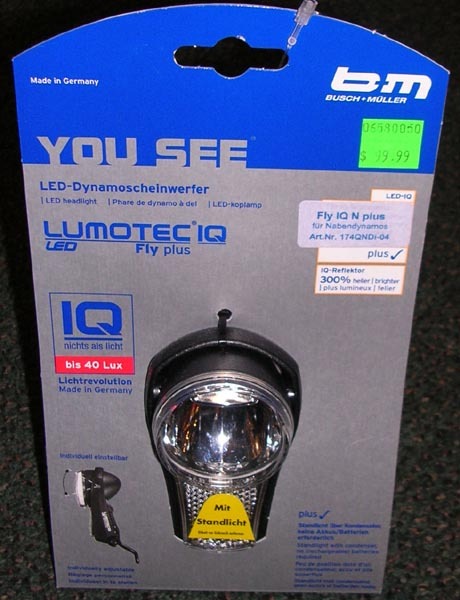 Busch & Muller Lumotec IQ Fly headlight. We sold thru our first order in 2 days! More on the way! We have one on display. 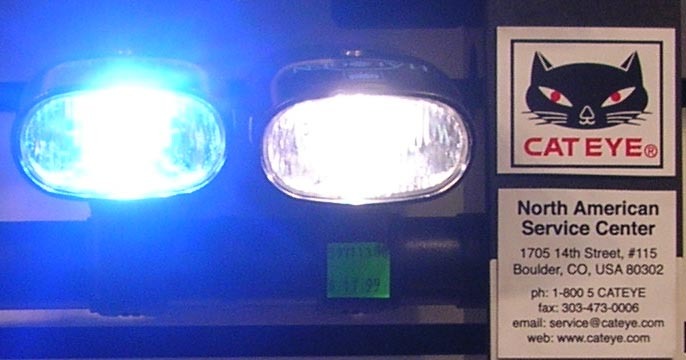 We have replacement LED bulbs for most incandescent headlights (and most flashlights). Increase your run time and in most cases get more light! The LED is on the left. Who could resist? 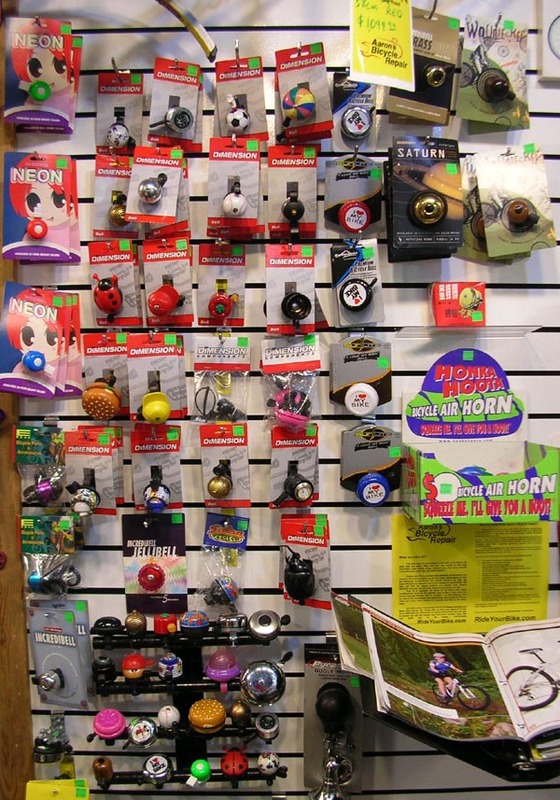 Every bike needs a bell. We have the best selection in town. 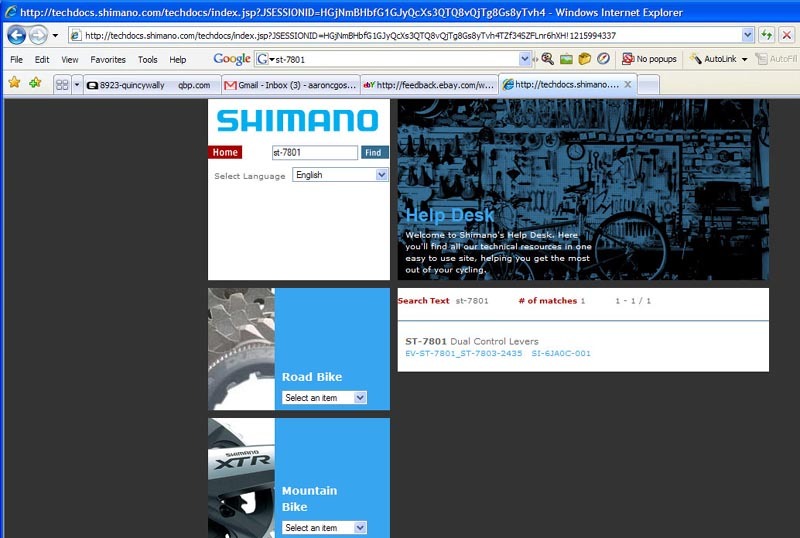 A picture of our shop has been used as the banner on the Shimano Tech Documents webpage. The picture is of the front bench at the old location. 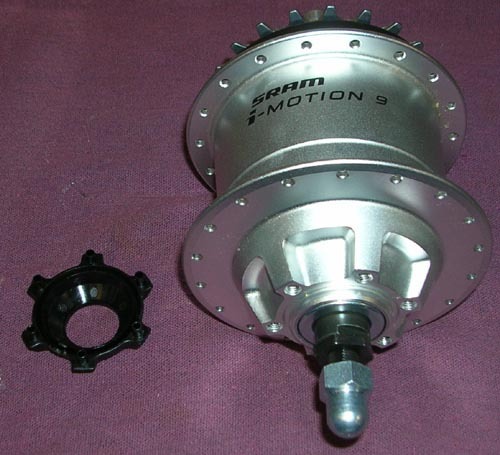 SRAM i9 and Shimano Nexus Inter-8 internally geared hubs are in stock! 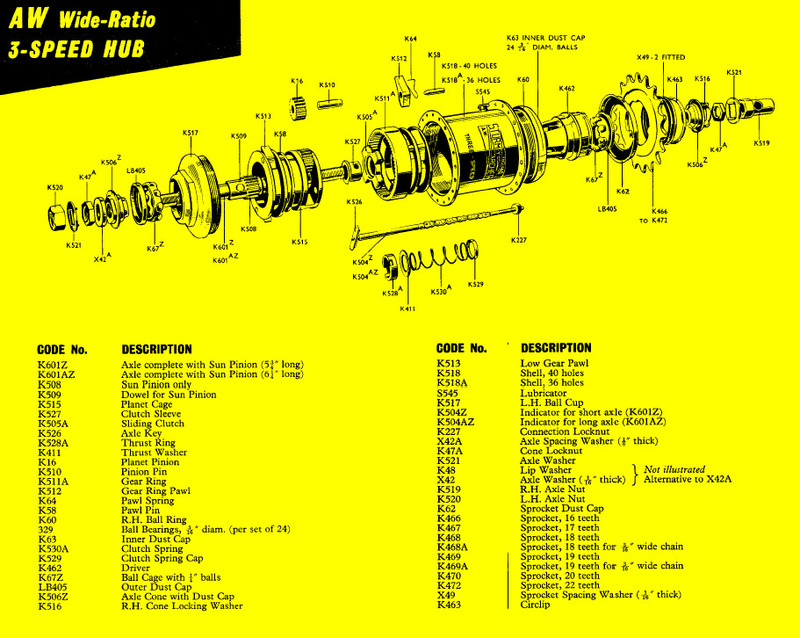 The SRAM hub is rim and ISO 6-bolt disc compatable. 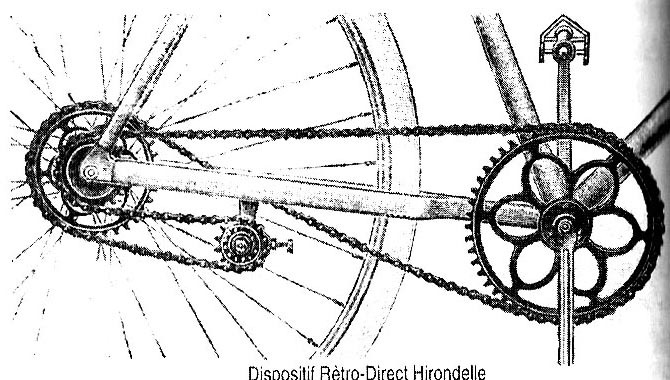 The Shimano is rim and roller brake compatable. We now have, perhaps, the burliest repair stands on Earth! 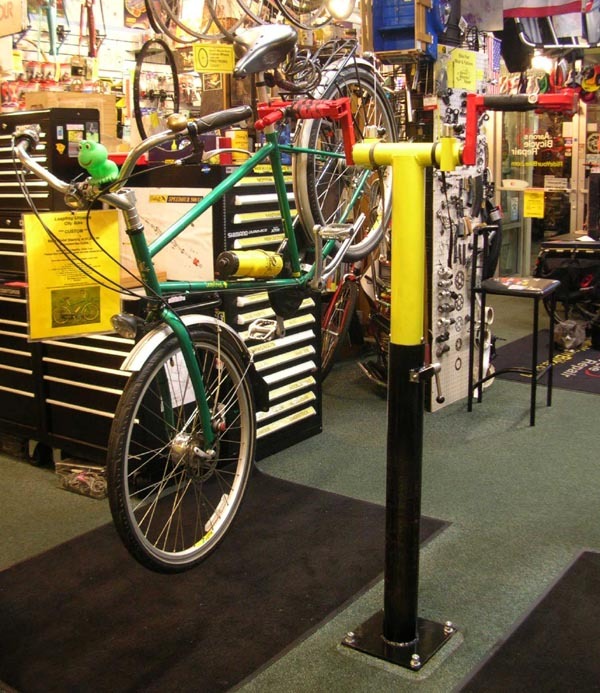 The Park double arm repair stands served us well for 11 years. However, we needed the stands to NOT MOVE when one mechanic is wrenching hard (eg. 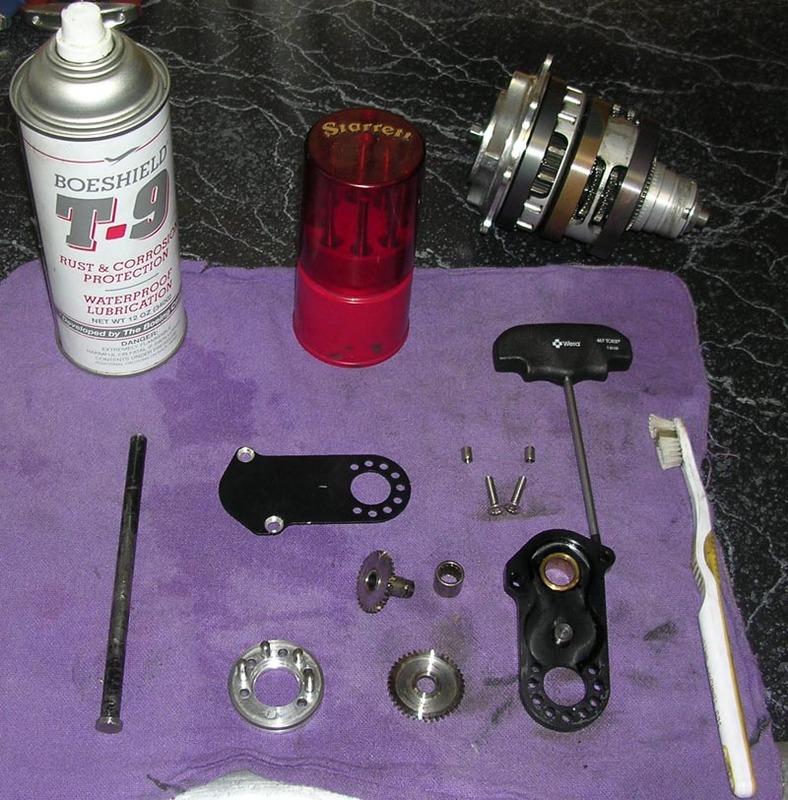 tightening a bottom bracket) on one side and the other is trying to do something delicate (eg. putting loose ball bearings in a headset). Aaron went to the metal yard and found the biggest telescoping tubes he could find. 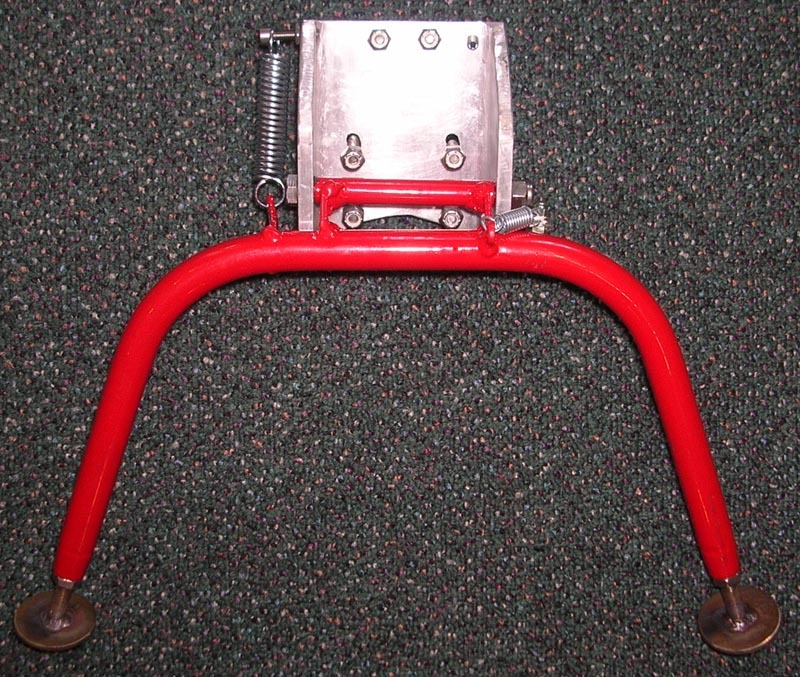 Then he called Park Tool and asked if we could buy just the top part of the PRS-2 stands and the lock-block mechanisms. Our shop landlord, Kenny, welded it all together. Sawyer had the idea to paint them yellow. 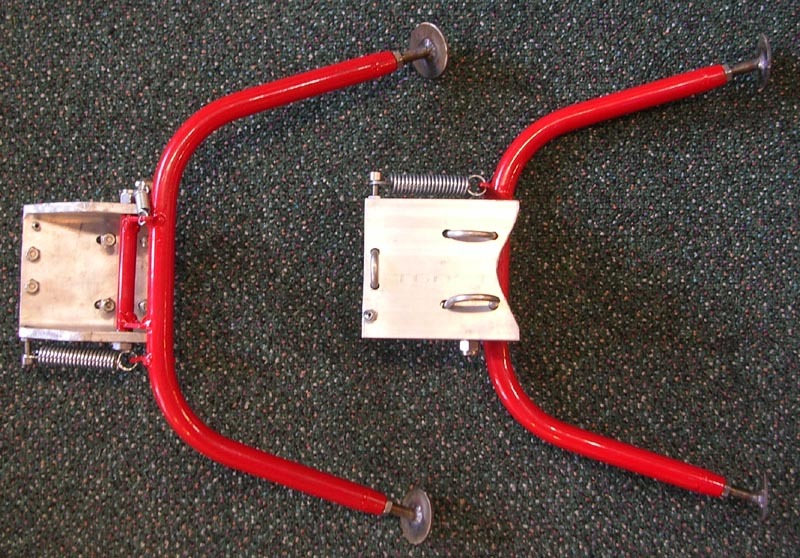 We upgraded to Effecient Velo Tools Right Arm Repair Clamps. Finally a hole was drilled thru the upper tube and a shaft with two R4 cartridge bearings on each side. 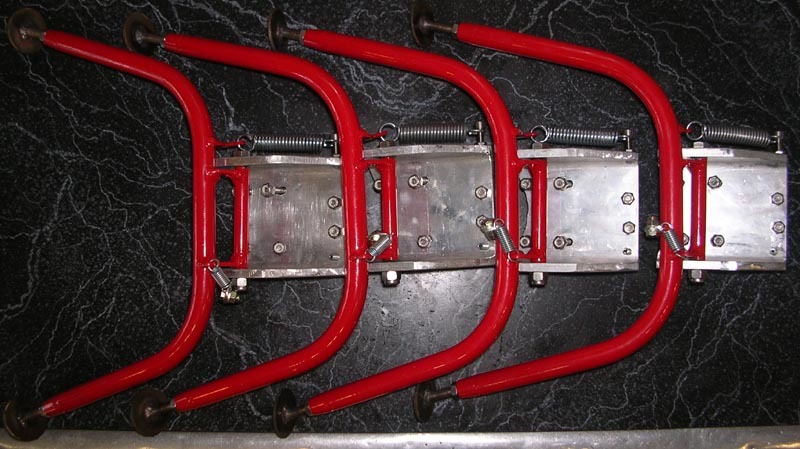 These roll on the top of the lower tube and allow the stand to rotate 360 degrees. The stands are 56" tall to the center of the cross member. 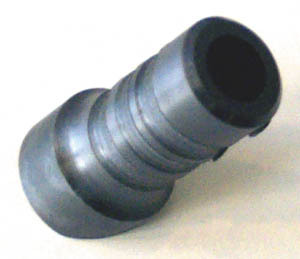 The lower tube is 4" outside diameter and the upper tube is 3 1/2" O.D. Wall thickness is 1/4". Base plate dimensions are 1/2" x 10" square. Carpet has been wrapped around the bases to protect the top tube if the bike ever falls against the stand. It doubles as a scratching post for our shop cats, Presta and Schrader! Schlumpf Drives now in stock! We stock all 3 versions, Mountian Drive, Speed Drive and High-Speed Drive. 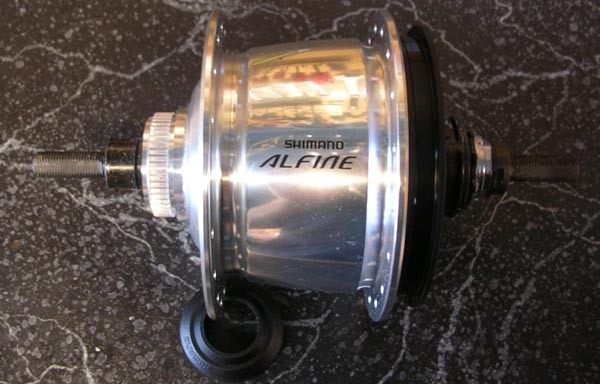 An ABR exclusive: Asymetric Flange Phil Wood rear hub. 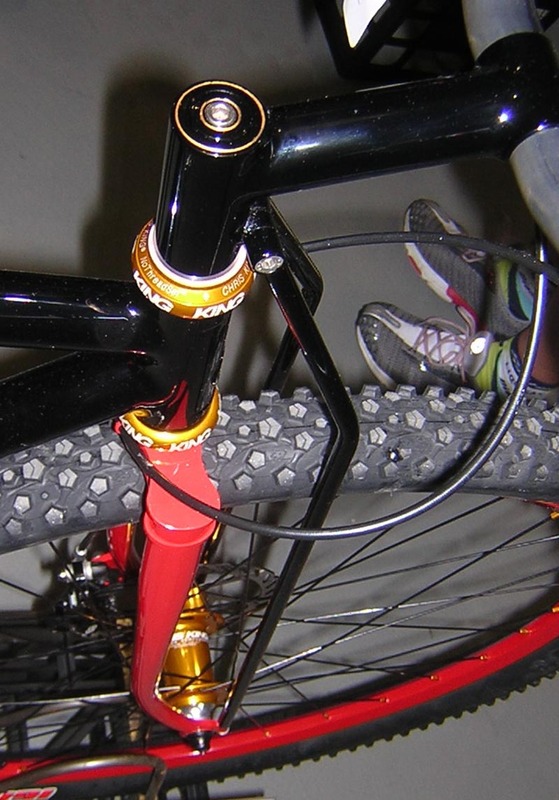 A large flange on the drive side gives a shallow angle to the spokes making the wheel laterally stronger. The official name for the hub is G-Touring. The 'G' is for Goss: Aaron's last name. You cannot get this hub at any other shop. 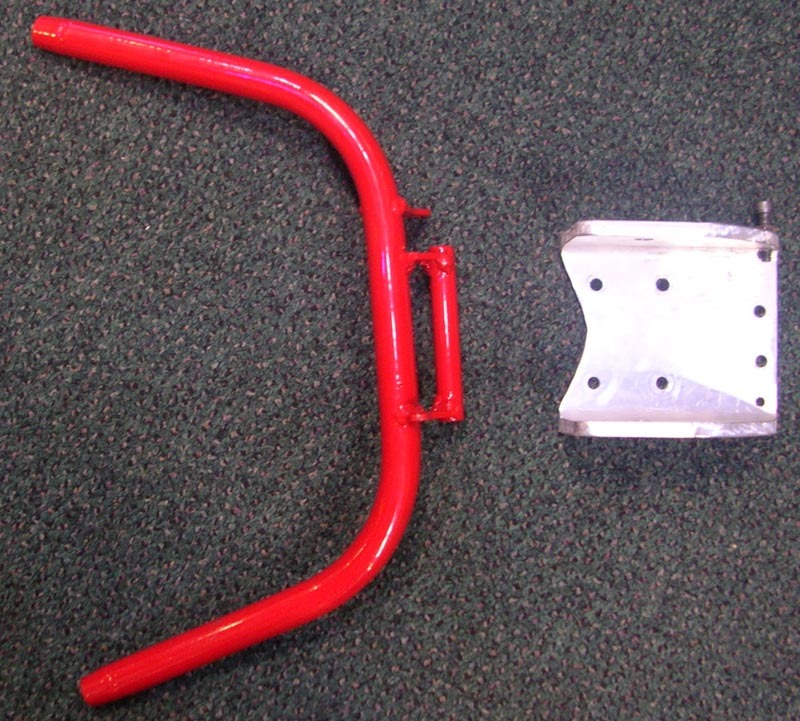 Options include: Steel or aluminum axle, 130mm road spacing, 7 speed cassette body. 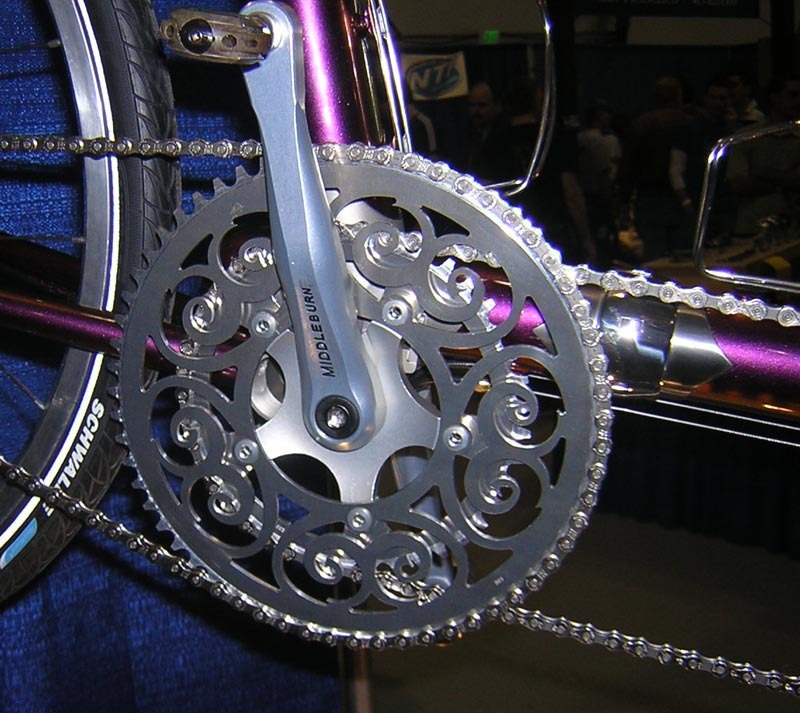 There is no reason to have asymetrical flanges with a dishless rear hub (example: 145mm OLD, 7 speed). We are currently SOLD-OUT of Free Radical Kits. 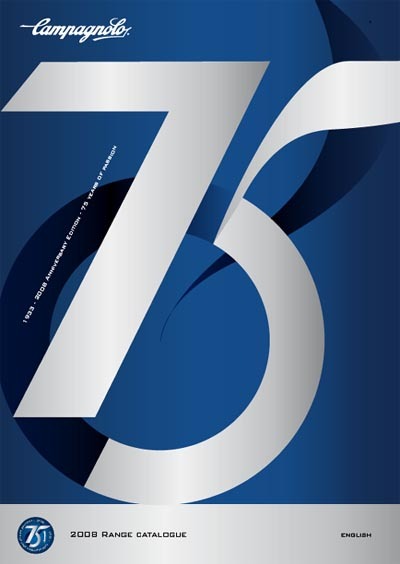 We are accepting deposits for a mid to late October shipment. UPDATE: Back in stock as of October 15th, 2007 We will be stocking the Surly Big Dummy frame (and complete built up bike) as well when it is available. 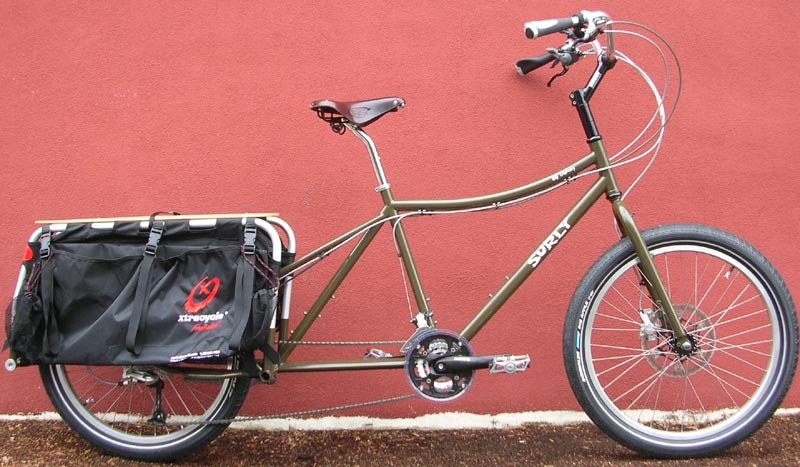 My friend Todd Farhner of Clever Cycles is developing a combination Xtracycle/Bakfiets. An Xtrabak for short. 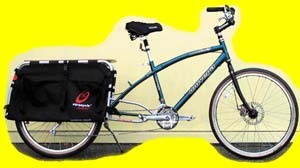 It will most likely be made in the USA and will be a unified frame similar to the Big Dummy or our Cargo Bike Design. 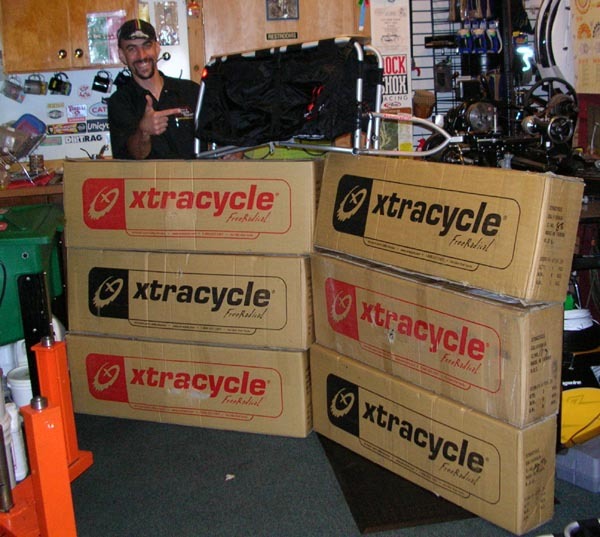 Here is our manager Gregg with our latest shipment of Free Radicals (Xtracycle attachments). 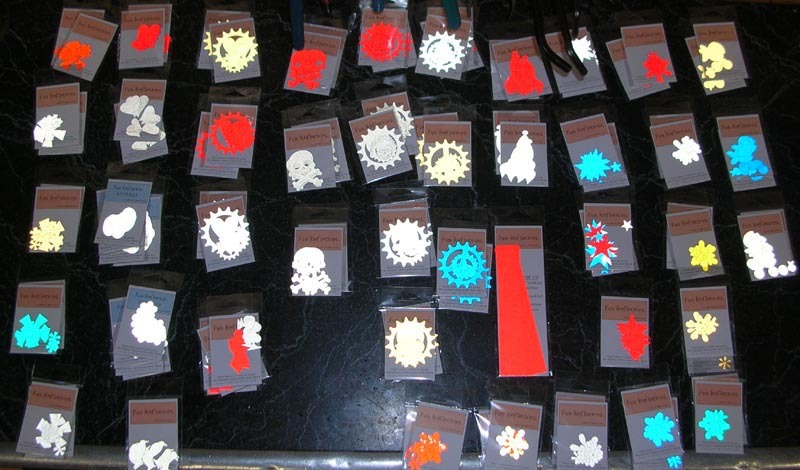 We are pleasantly amazed at how many we are selling. It is really heartening to see so many people getting interested in using a bicycle instead of a car for groceries, taking kids to school, commuting and just getting around. 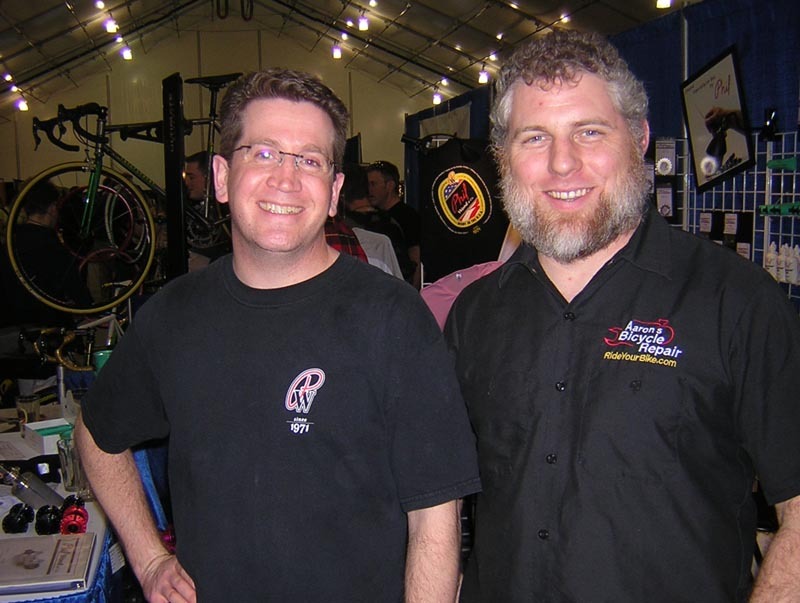 Mikey, our former head mechanic has agreed to come back to work for me. He is perhaps the best mechanic ever. Seriously. This dude goes to bed with bike catalogs! 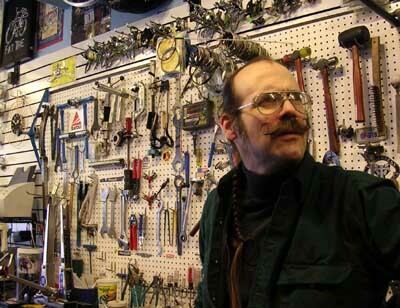 He is a true career mechanic who totally loves bicycles. Look for him to be back in the shop in late August. Mikey is an expert at suspension. He can diagnose and repair any shock. 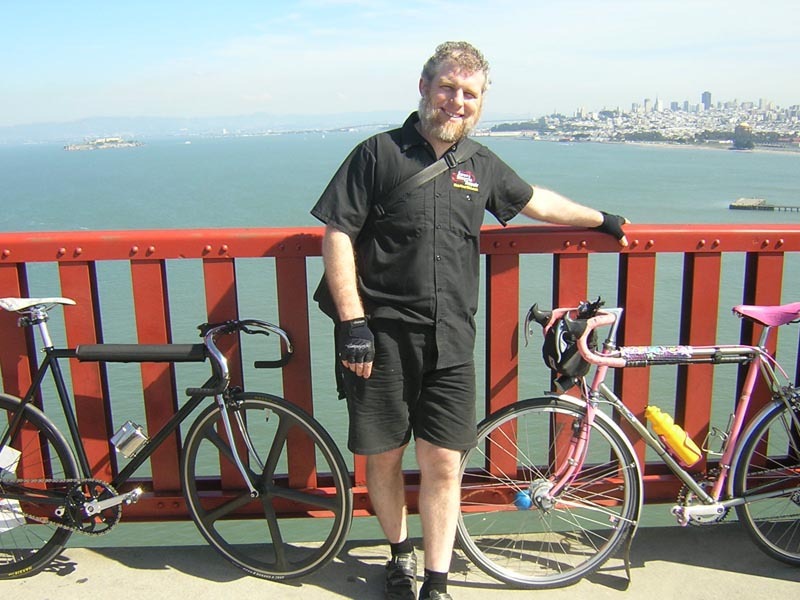 For those of you that were lucky enough to have Mikey work on your bike, you know what an excellent mechanic he is! 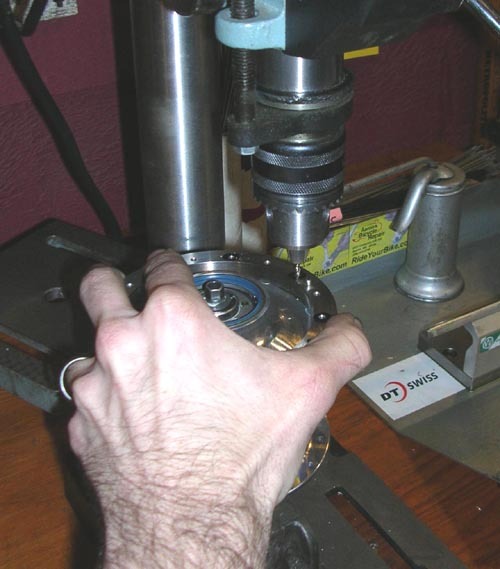 We can now drill your Rohloff hub for 48 spoke rims. The spoke pattern is 2 cross (modified) and radial for a crow's foot pattern. Here's how we did it. Aaron has taken a role as the race mechanic for a women's contingent, mostly from the Seattle area, racing in the Mt. Hood Cycling Classic early this June. The women race for Jet City Velo, Union Bay Cycling, Bike Hugger teams to name a few. The race is a 6 day stage race held in Hood River, Oregon. 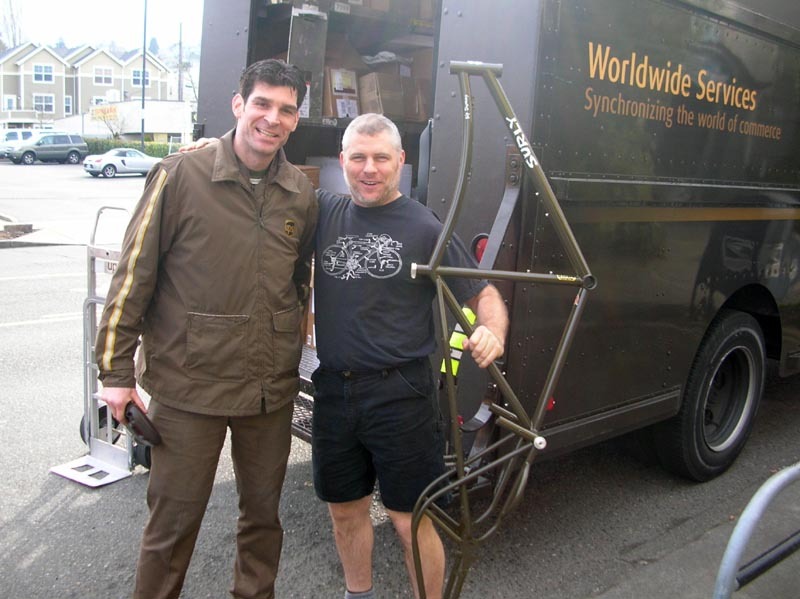 We may become the us service center for Rohloff hubs! We already are able to service the hubs externally and replace the axle bearings, do oil changes, etc. 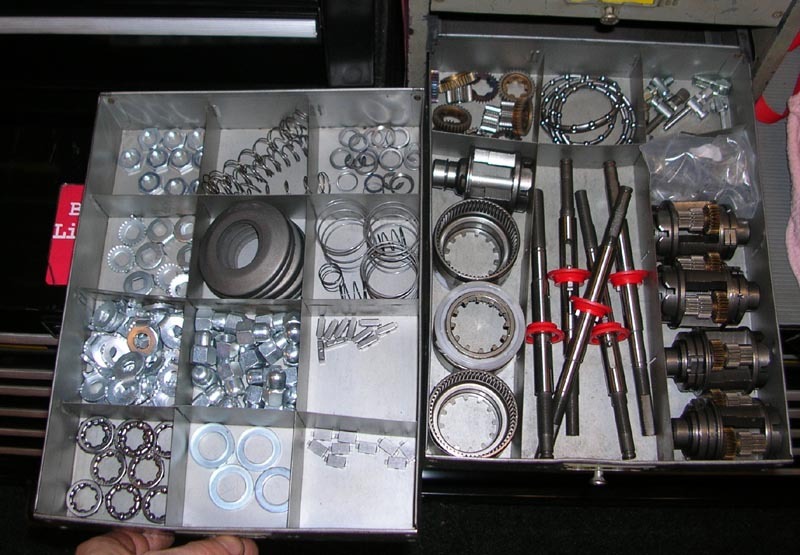 We stock all the normal external replacement parts, oil, cogs, and tools to maintain your hub. The big news will be if the folks in Germany will sell Rohloff USA the special tools needed to service the guts of the hub. 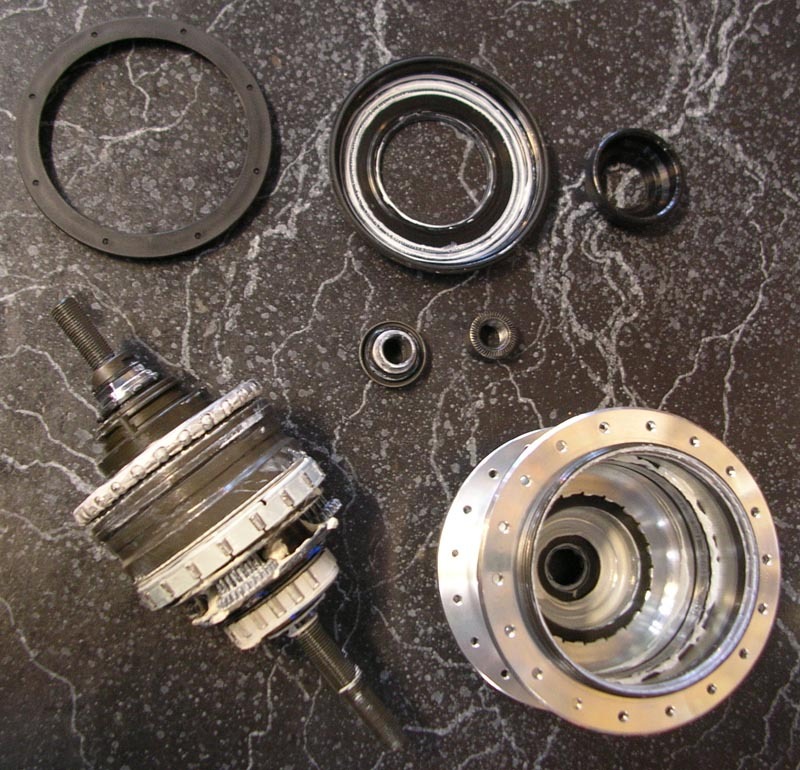 The large hub bearings can fail and right now, you have to send your hub to Germany for repair. It would be nice if it could be done here in the USA! 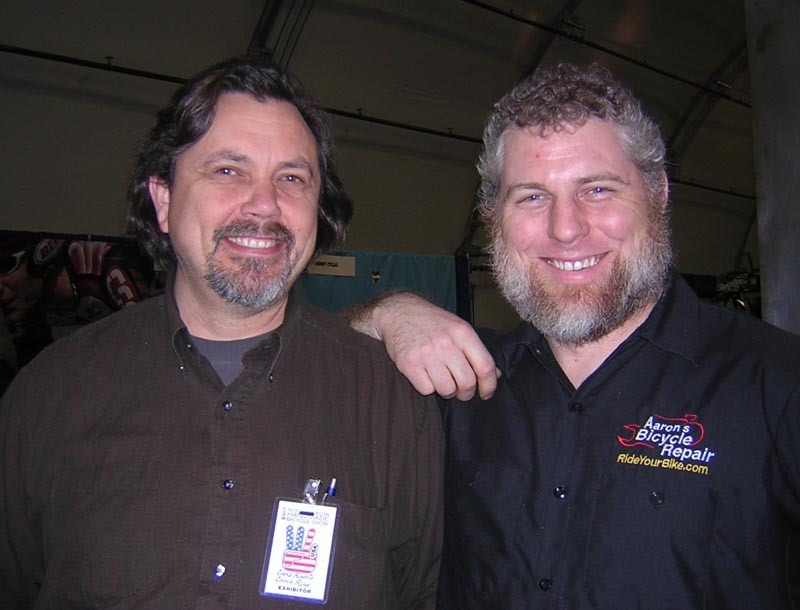 Between Val Kleitz and myself, we have more internal gear experience than any shop in town. We are up to the challenge! 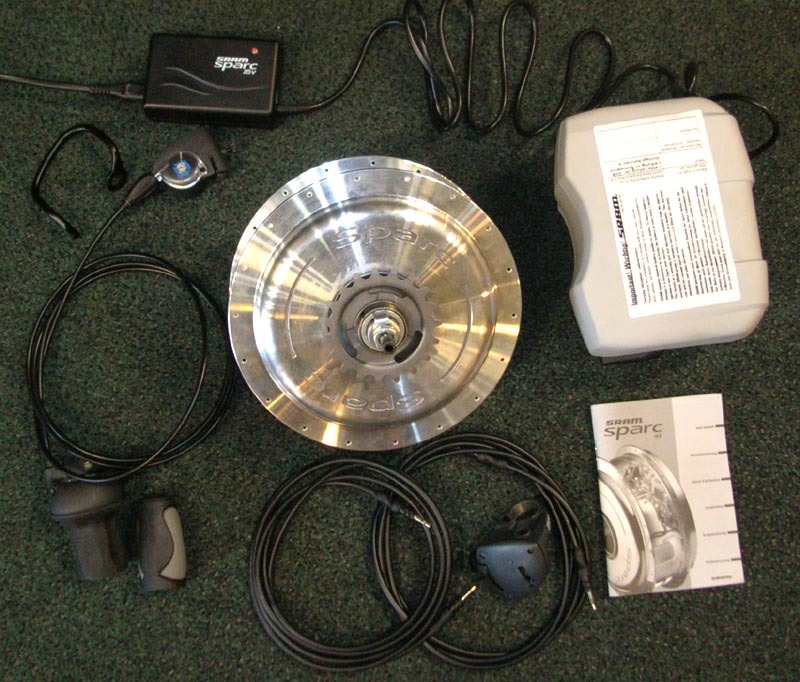 We also can service any brand of internal hub. 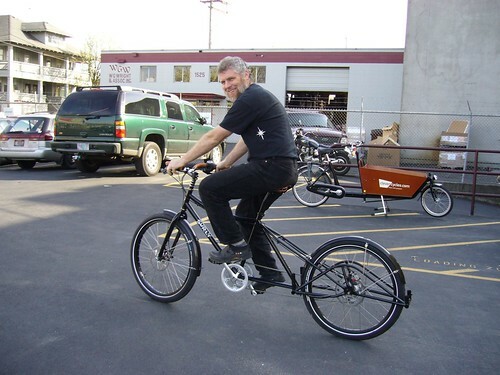 Yesterday Aaron visited Todd of CleverCycles in Portland, Oregon and got to test ride a Big Dummy (read about it on the Surly Blog or on Todd's Blog. 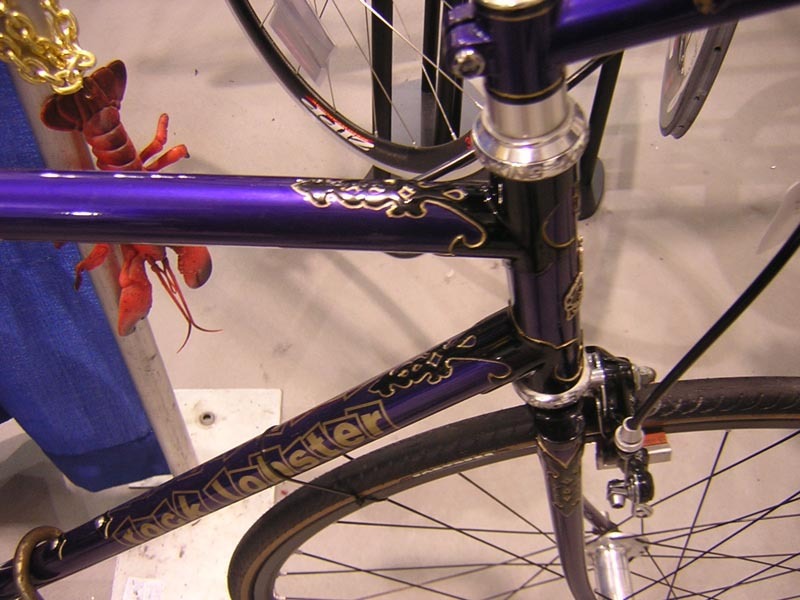 The date for the first shipment of framesets should be in August 2007. Delays happen, we were supposed to get them in June. Test riding the Big Dummy! Note the Bakfiets in the background. 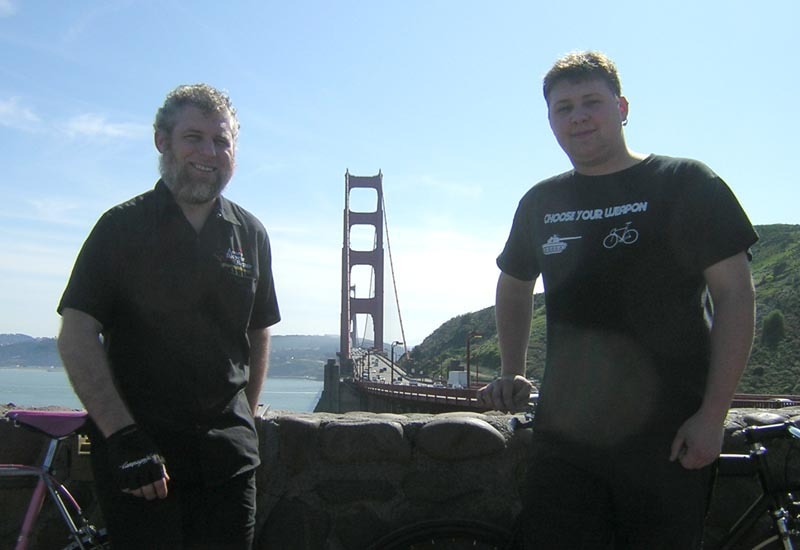 I was allowed to ride both bikes for 5 or 6 miles each. Very nice! 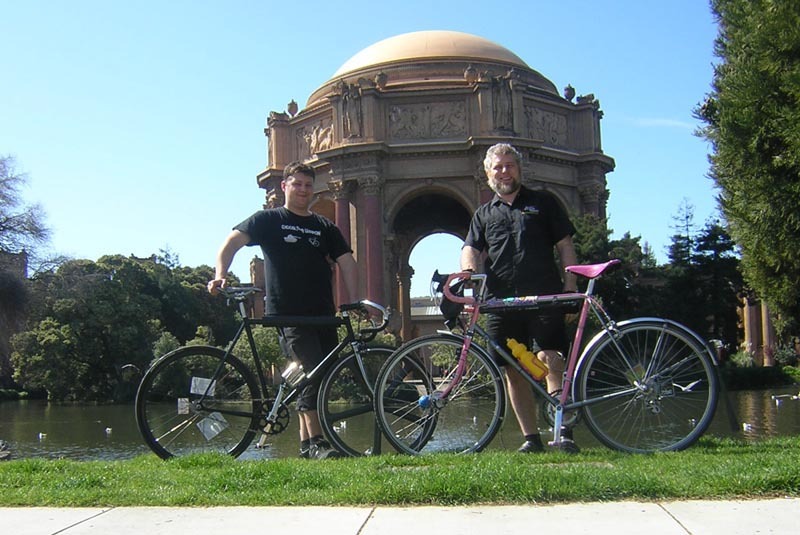 In early March, Aaron and Jessie took the train down with their bicycles to the 2007 North American Handmade Bicycle Show in San Jose. It was a weekend of sun, bike, lust, desire, LUGS, geekiness and riding! 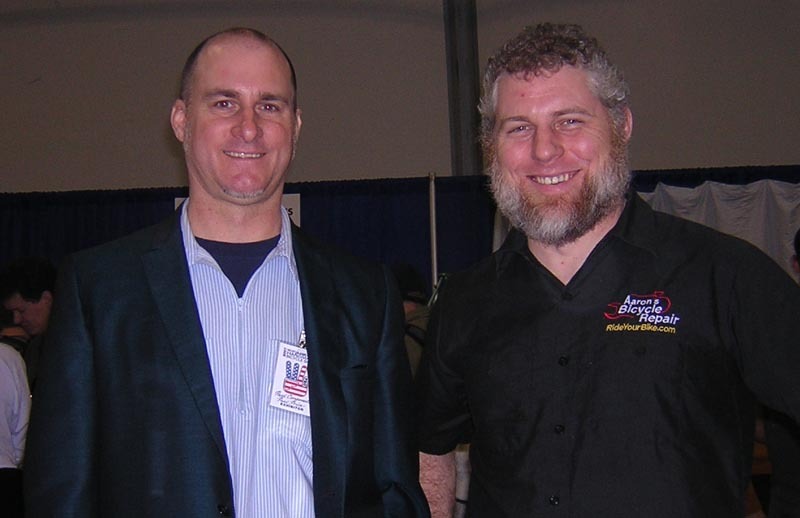 Brent, Chief Executive Director of Absolutely Nothing, Phil Wood & Co. 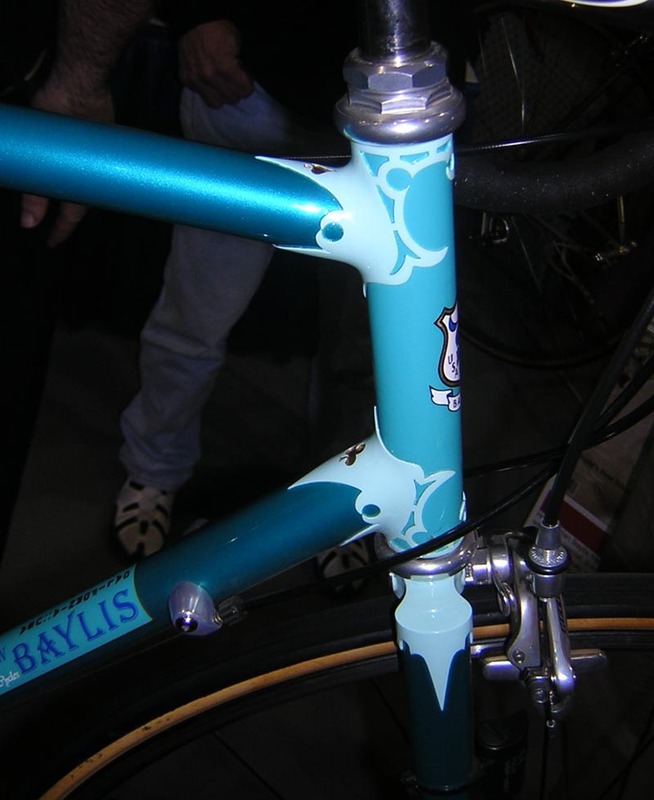 This bike by Calfee looked quite organic. Aaron in San Jose, warm weather! 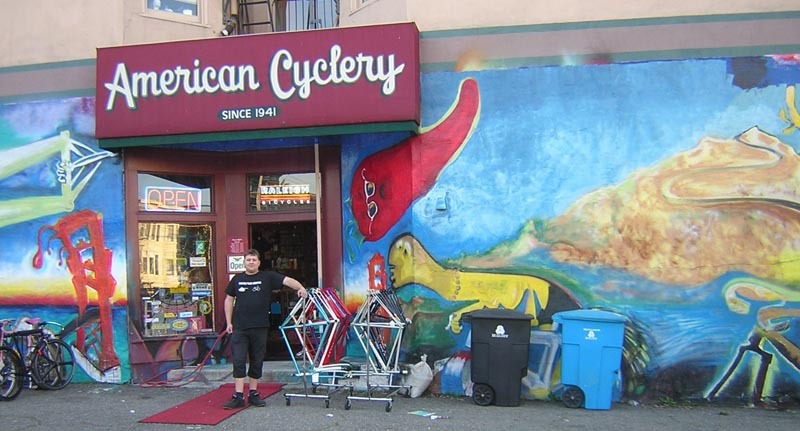 The SF messengers had an alleycat to the show. 110 miles round trip! Fleur de lys were everywhere! 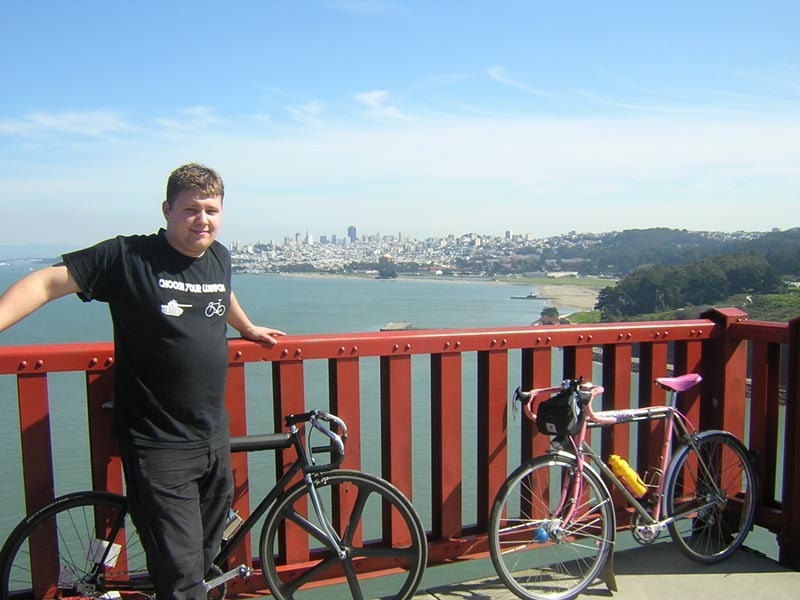 Jessie getting his SF Messenger on. We rode across some rust colored bridge. Ashiatsu is the deepest massage you'll ever receive. The technique is done with the feet. I do not walk on your back, I keep one foot on the table while I do deep soothing effleurage strokes on the body. Also working here on Wednesdays is Dari Haffie, the northwest's only certified instructor in this technique. Interloc Racing Design (aka IRD) has developed new high quality freewheels! We stock all sizes! 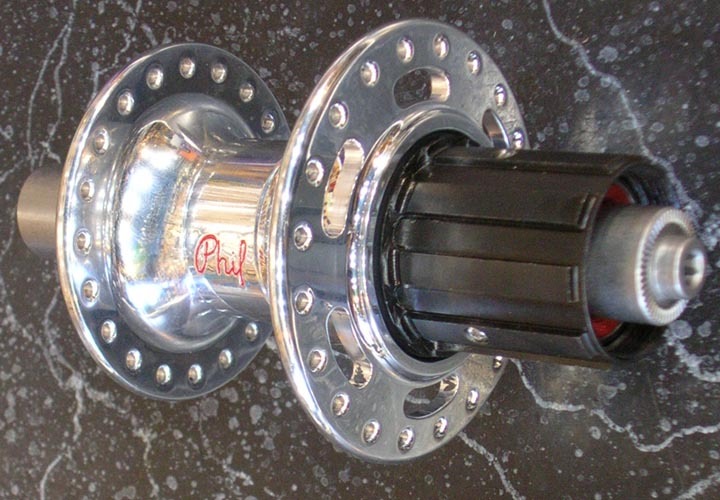 We also plan on stocking Phil Wood freewheel hubs. 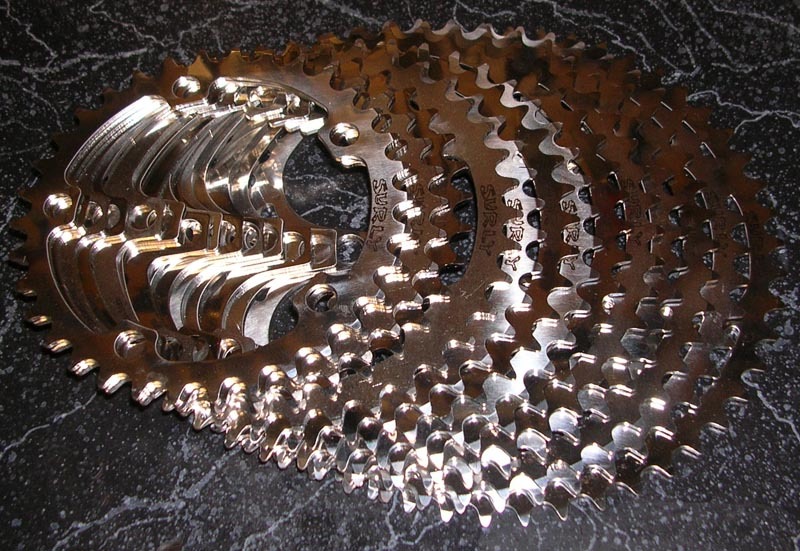 Ebay has for years been the best place to find rare or NOS (new old stock) bicycle parts. 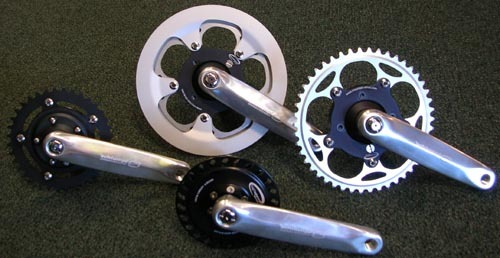 We keep our SunTour Winnner Pro cog board stocked from Ebay. 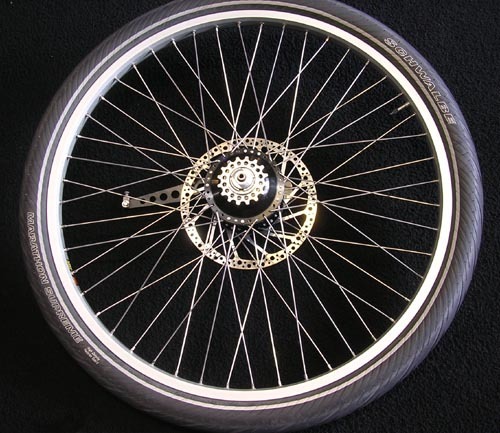 However, it costs $75 to $100 for a SunTour freehweel, which makes these IRD freewheels a bargain at $50. They really are top quality and even have shifting ramps! Today is Gypsie's second annual 39th birthday. She is on holiday in Oregon with Braxton. 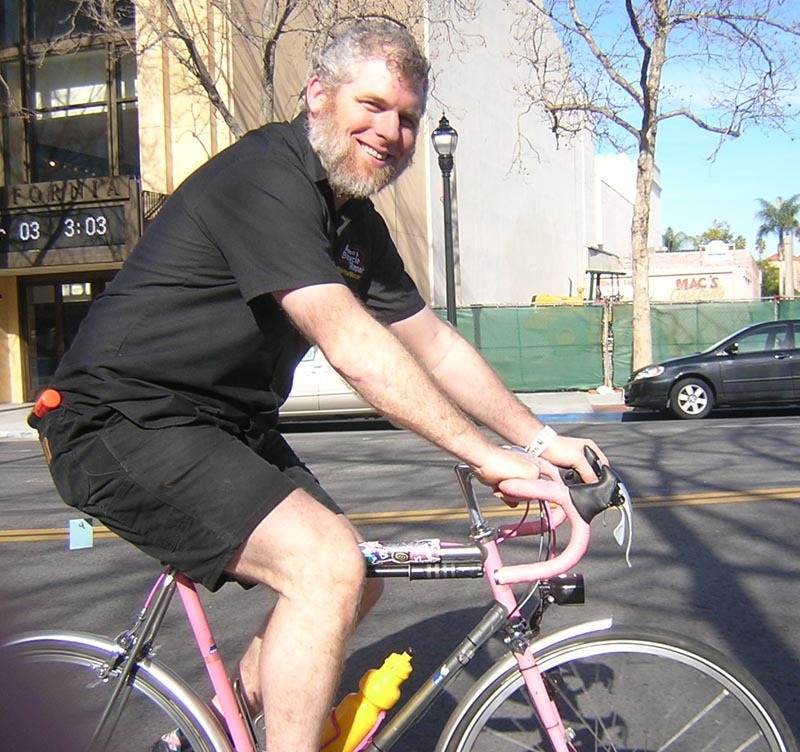 Our manager, Gregg-on-a-Bike, has joined the ranks of Xtracyclers! Update, Our lathe is almost ready! Just waiting on one final replacement part and we are in business! 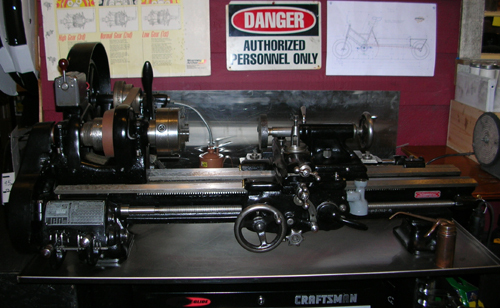 Originally posted Winter 2004 Recently the shop purchased a South Bend 9" metal lathe. Aaron is in the process of cleaning and painting it. It will look better than new when he is done. 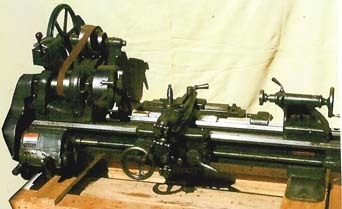 There are a lot of parts to a lathe! It was made in the USA in the early 1940s. The amazing thing is that all replacement parts are still available for it. You just don't see that much in todays throw-away society. 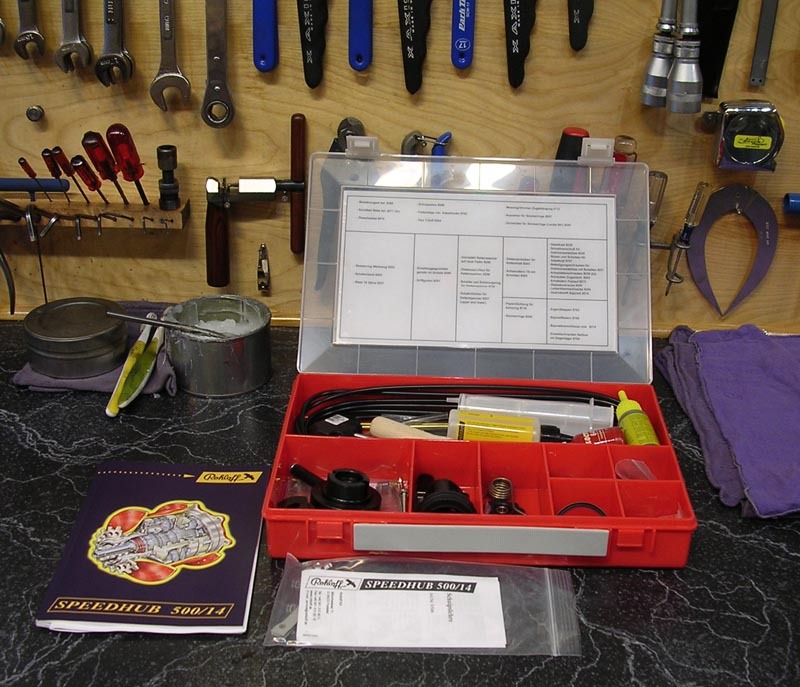 We love that because fixing and repairing things is what we do. We will be able to make replacement parts for obscure bikes and machine worn parts like headsets, bottom brackets and hubs. Gregg Sundin is our new manager. We met Gregg through .83 He takes Andy's place as Andy wanted to pursue computer tutoring full time. Clark Kent is the new owner of ABR. 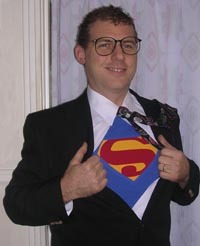 Superman stops by often to get broken spokes replaced, but strangely Clark is always "in the bathroom" when he stops by. 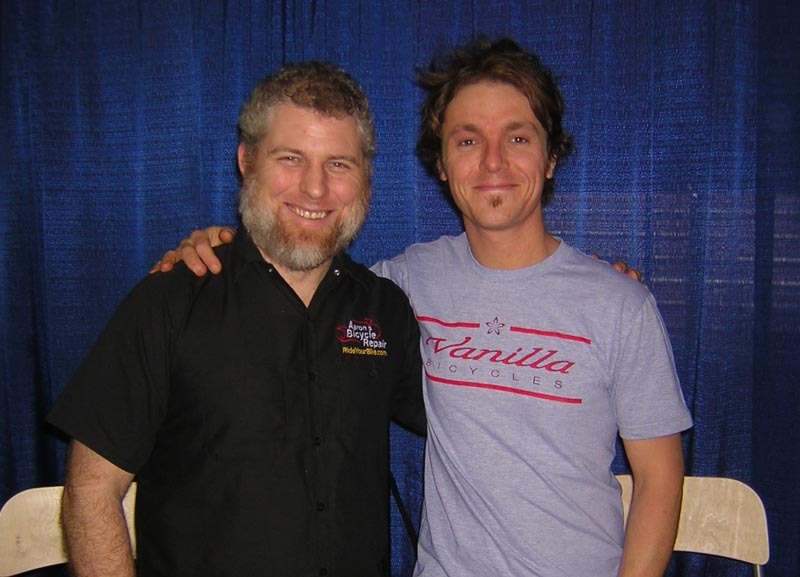 When I hired Val, we had a gentleman's agreement that he would be looking for work closer to his house. He wanted to be able to ride his bike every day. 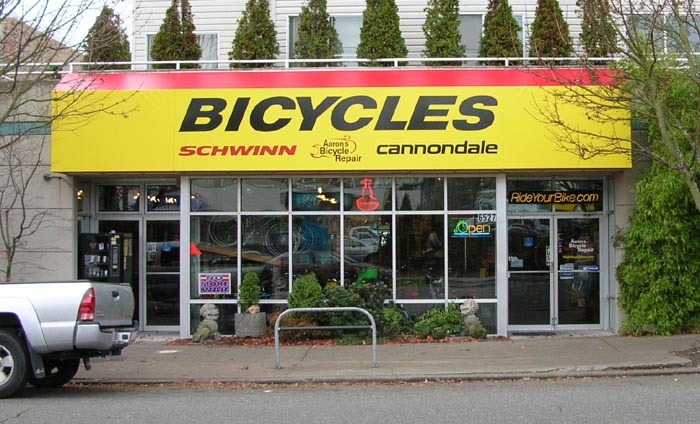 Val now works at Seattle Bike Supply. He is their SRAM technical and waranty manager. I still see him and his spirt is alive and well here at ABR. 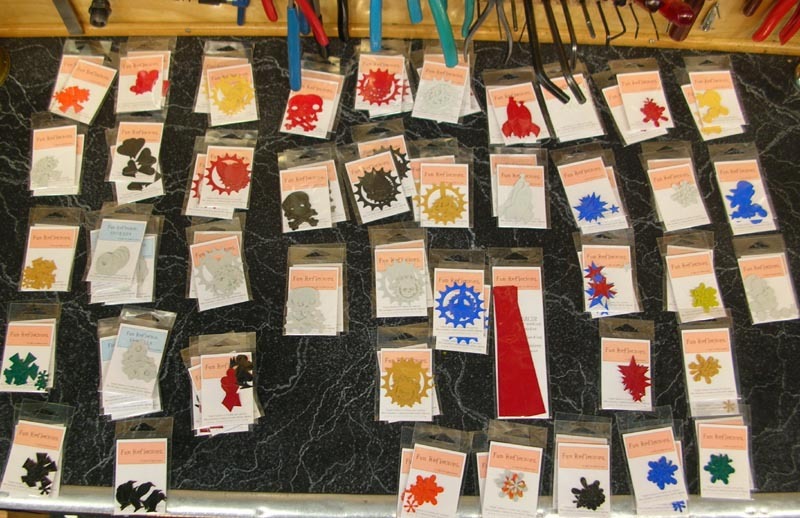 This winter we hope to organize all of the internal geared and Sturmey Archer parts we got from the Bikesmith when it closed. Val works at ABR on Sundays. We have the Nortwest's largest selection of cycling caps. Over 125 in stock! 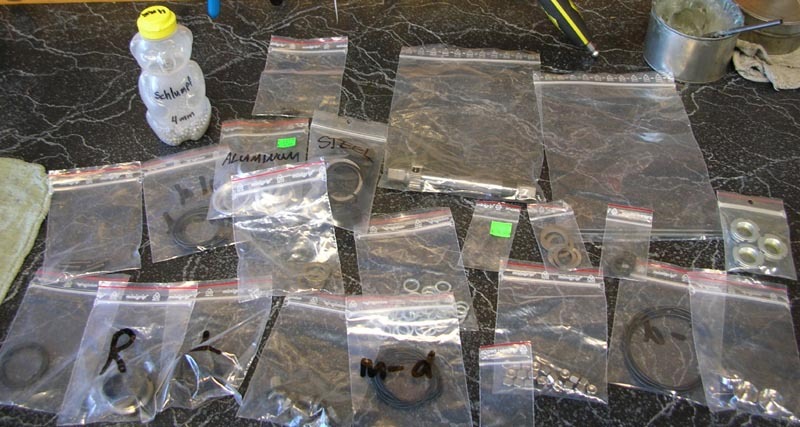 We have aquired all of the late Bikesmith's internally geared and Sturmey Archer hub parts. 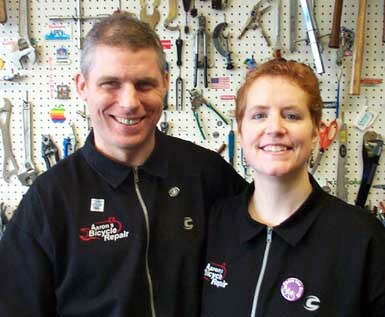 Brands include Sturmey Archer, Shimano, Bendix, SRAM and Sachs to name a few. 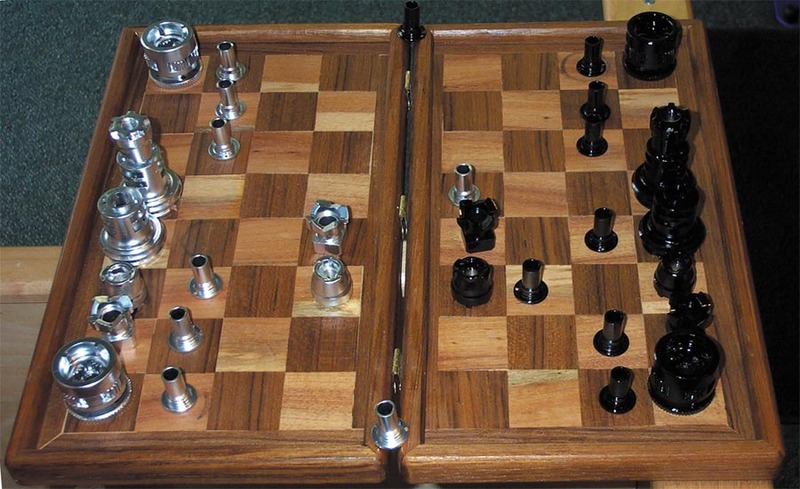 Come by for a rebuild or replacement parts. 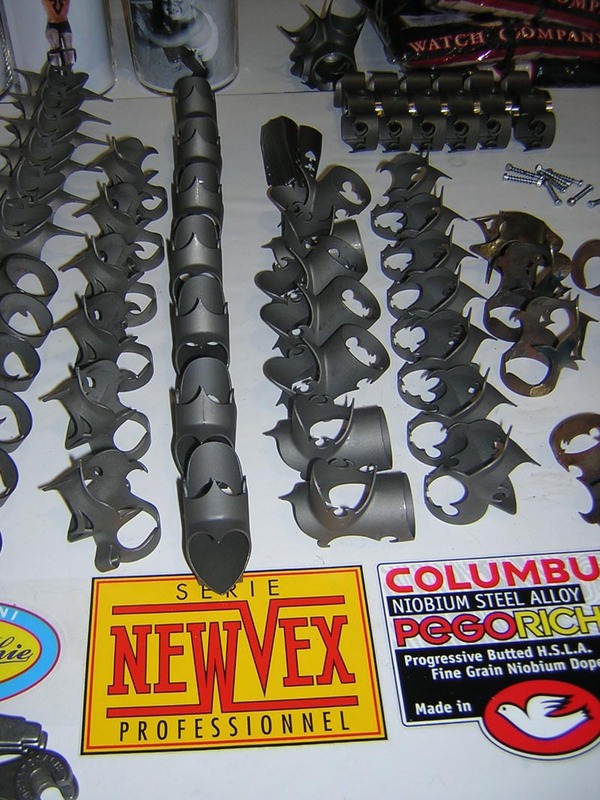 Our inventory is extensive. Ask for either Val or Aaron to help you. This product was an accident. 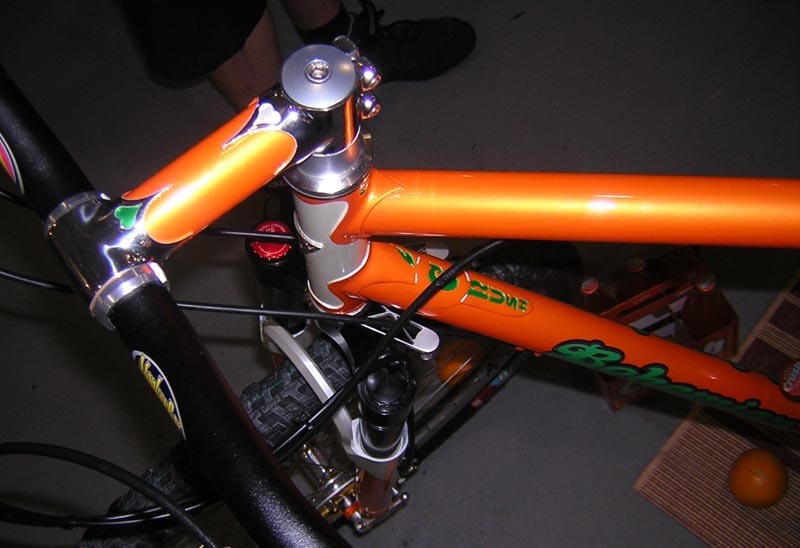 The guy that makes them needed a kickstand extension because his was cut too short. It turned out to make the bike more stable and it looks cool. They look like a horse's hoof. 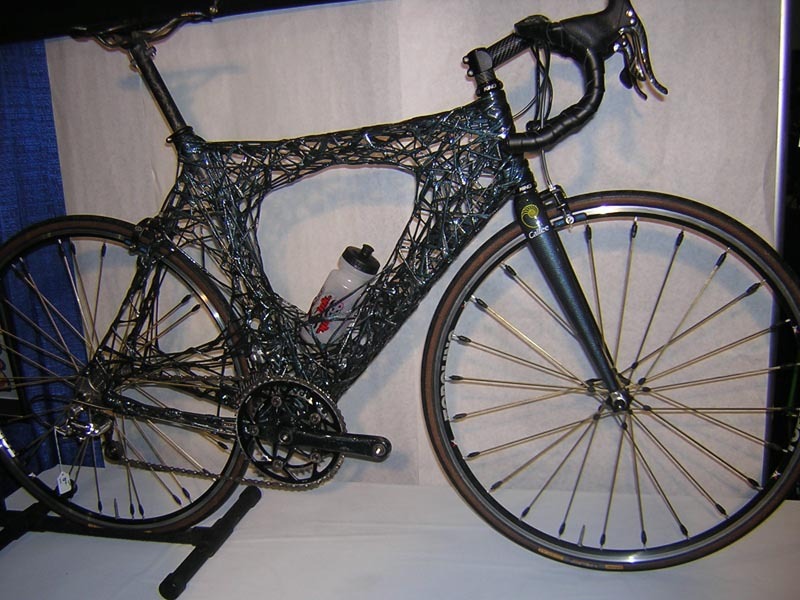 Kind of cool considering the Bicycle is also known as the Iron Horse! 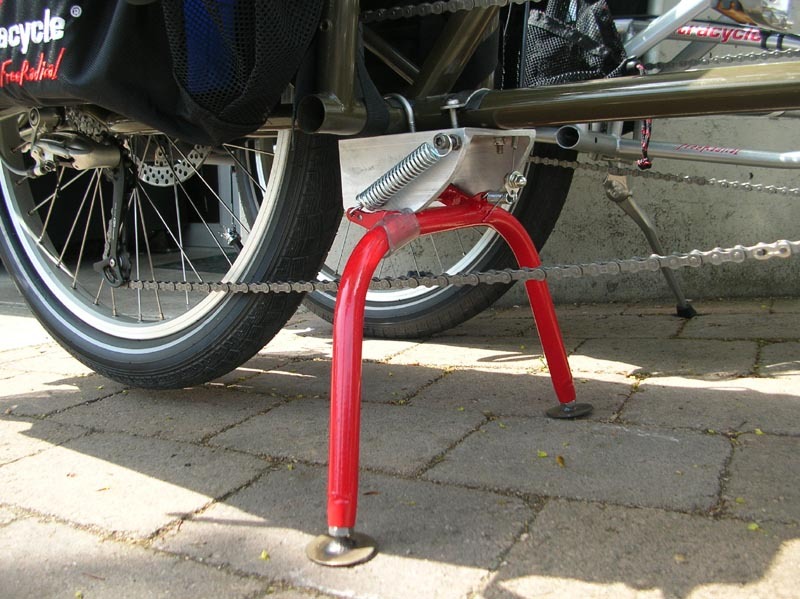 They will last for years (your kickstand probably will break first). 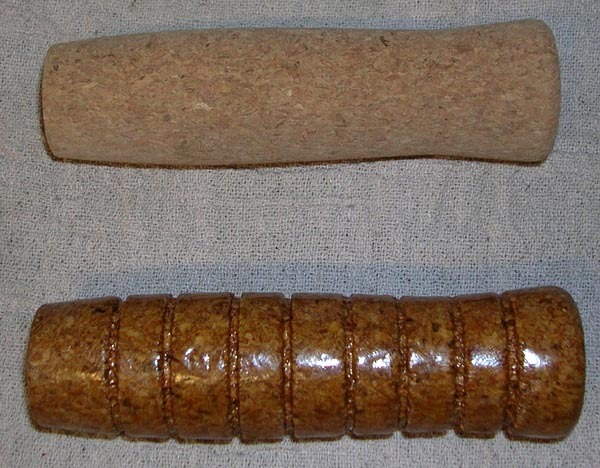 The material is called Nylatron and contains Molybdenm. It gives it a nice metalic satin look. 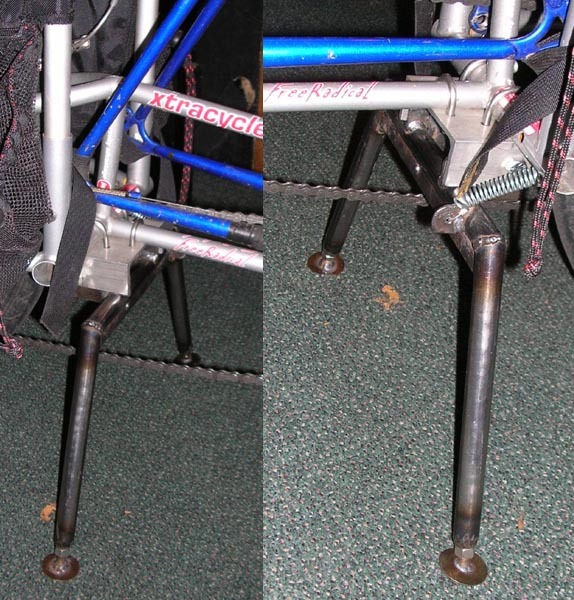 The Free Radical is a bike extension made by Xtracycle. 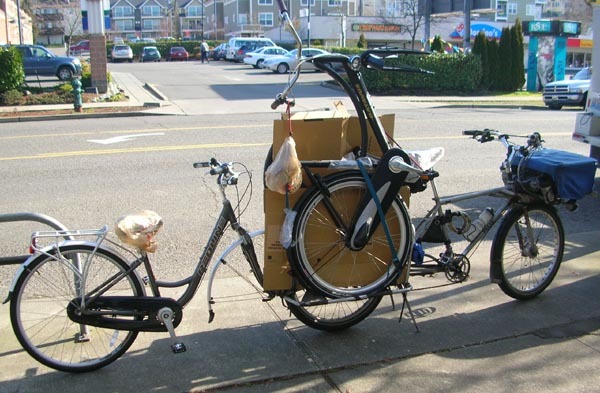 It converts any 26" wheeled bike into a cargo hauling machine. The handling of the bike is made more stable yet still nimble and manuverable. 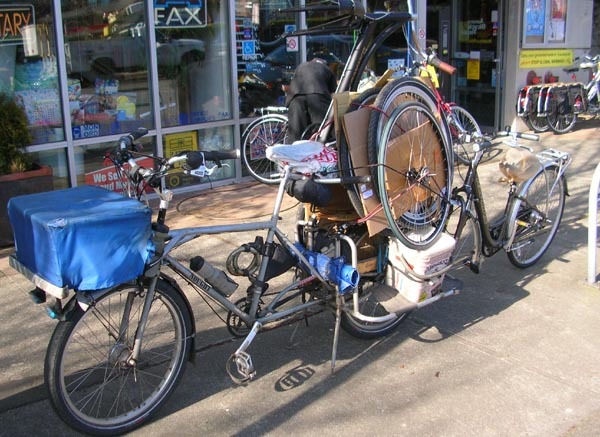 The added weight is only 10 pounds, yet the bike is capable of carrying 500 pounds! This picture is of our rental bike outfitted with one. Come test ride one anytime. 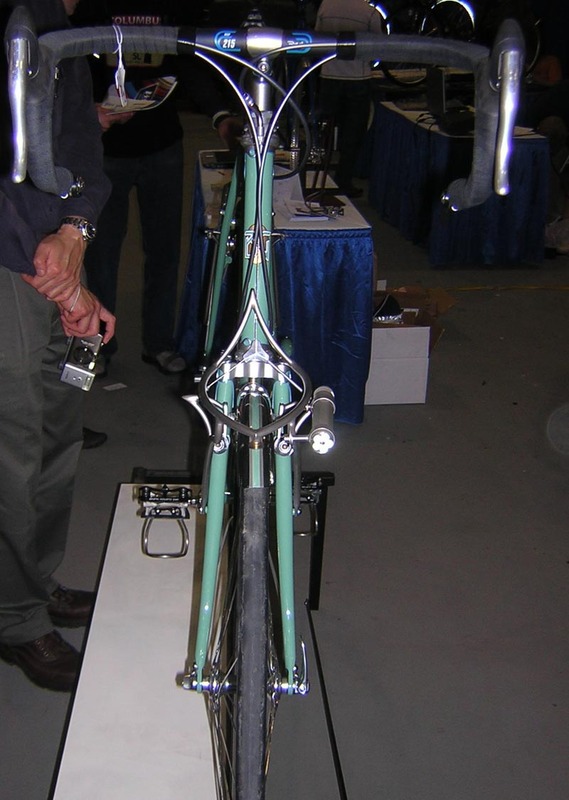 Converting your bike will require a V-brake in the rear. Cost for a good one with adapter is under $60. 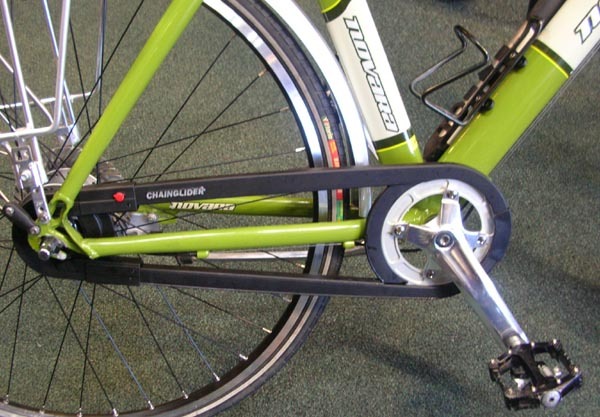 If your bike already has V-brakes, no problem. Cool rainbow colored leg bands by Jevelot. They are elastic with Velcro for a comfortable fit. If you plan on riding at night, however, we recommend Yellow Racers.